GeoFest 2019 will run from Saturday 25th May to Sunday 1st September. Hundreds of events throughout the summer. More details will appear on the website as the start approaches. Fill your boots with an explosion of crafts, fossils and rocks. Delve into the deep blue and create your own ancient fossilised sea bed or stencil away and let your imagination shine. Create your own masterpiece with pebble and fossil painting to take home or join the ‘Love on the Rocks’ craze and share your artwork with strangers. 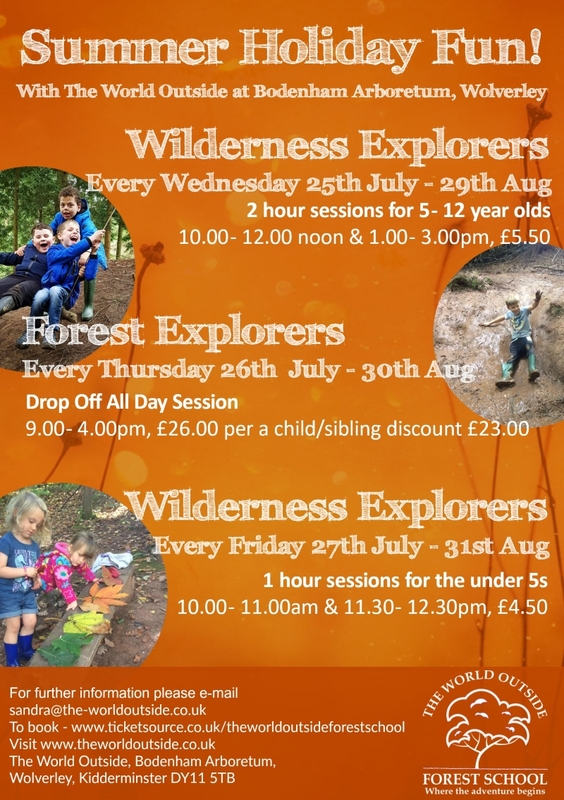 And then at the Wyre Forest on Tue 21st August 11:00-15:00. 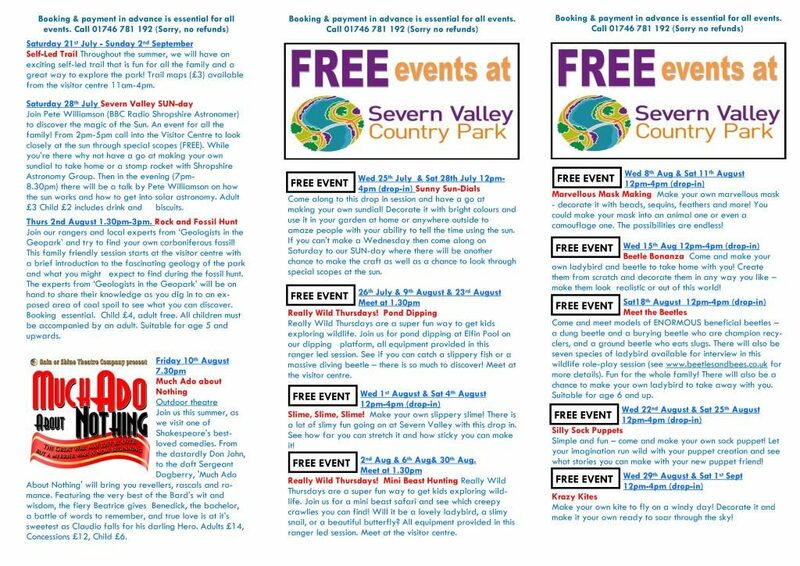 There are lots of events at Severn Valley Country Park this summer, including many that are free. Check out their guide to see what’s on offer. August is the last month of GeoFest, but there are still loads of events happening across the visitor in the Geopark. 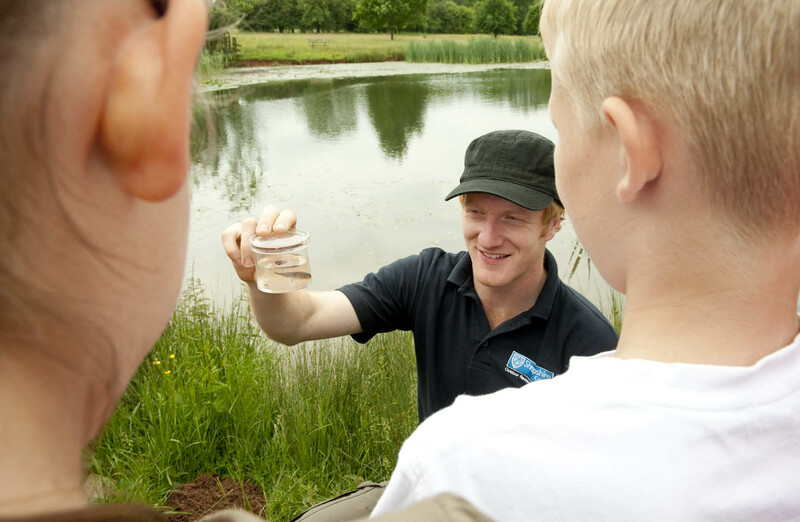 Severn Valley Country Park has a large range of events for families. On Thursday 2nd there is a Rock & Fossil Hunt, where rangers and experts will help you hunt for your own fossil. After an introduction you’ll head out to begin searching, and then at the end you can have a look at what you’ve found under a microscope. Booking is required on 01746 781192, and costs £4 per child, who must be accompanied by an adult. Details of their other events are below. 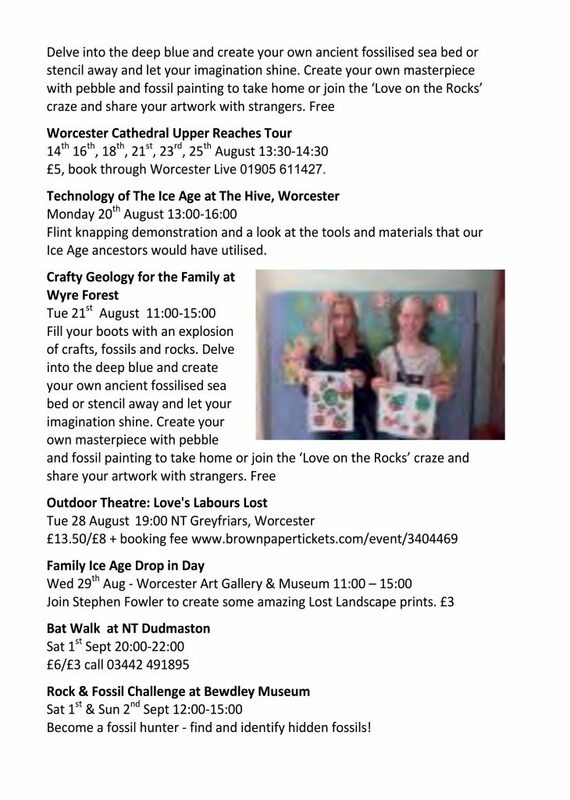 There are also free crafty family events at Worcester Cathedral and Wyre Forest. Fill your boots with an explosion of crafts, fossils and rocks. You can delve into the deep blue sea and create your own ancient fossilised sea bed or stencil away and let your imagination shine. Create your own masterpiece with pebble and fossil painting to take home or join the ‘love on the rocks’ craze and share your artwork with strangers. It is at Worcester Cathedral Thursdays 16th & 23rd August 10:30-12:30 and 2:00-4:00pm. It is at Wyre Forest 21st August 11am-3pm. Worcester Cathedral has many other activities too and you can go along on 14th, 15th, 17th, 21st and 24th August to join in. The Ice Age exhibitions in The Hive and Worcester Art Gallery & Museum continue until early September. 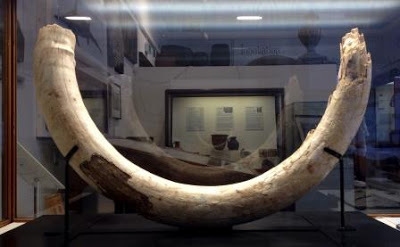 See a giant model of a mammoth, go inside an Ice Age Shelter and see real mammoth bones. There are a range of events to accompany this. 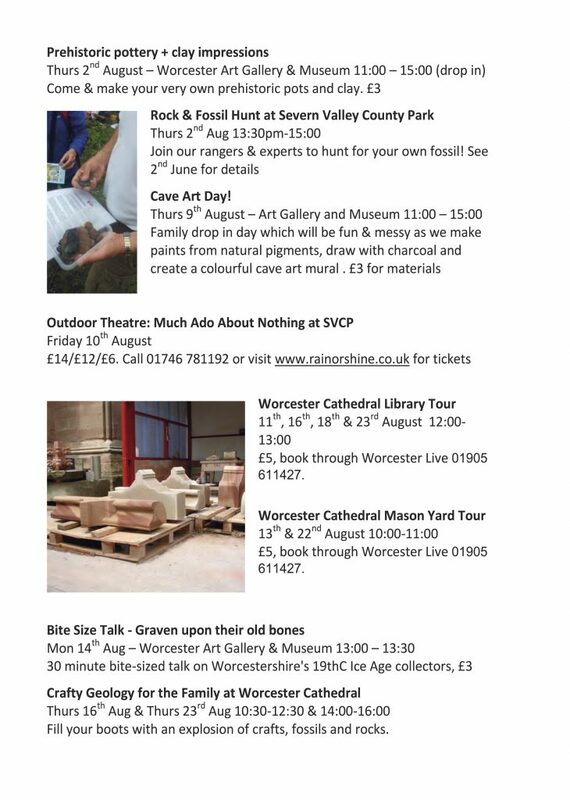 There’s a drop in prehistoric pottery session at Worcester Museum on 2nd August 11am-3pm (£3), and a cave art day a week later. Technology of the Ice Age come to The Hive on Monday 20th August 1-4pm, including flint knapping demonstrations. 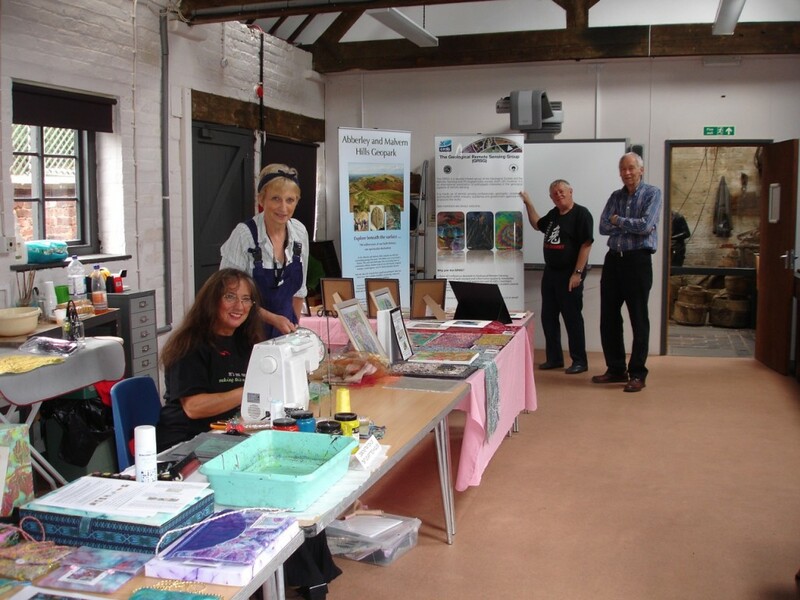 Bewdley Museum has craft events each weekday 11am-3:30pm. Entry to the museum is free, with activities £4 per child. This week the theme is the seaside, and next week it will be nature, starting with fossils on Monday. 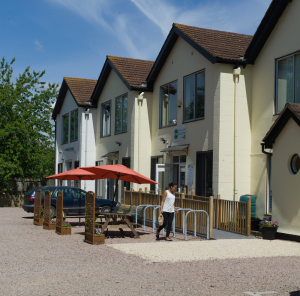 Cob House Country park is open every day to visit, and they have guests visiting over the summer. Worcestershire Wildlife Trust are there 1st & 2nd August, with Paint a Pot on the 3rd and Bear Club on the 7th. You can find out who else will be there here. 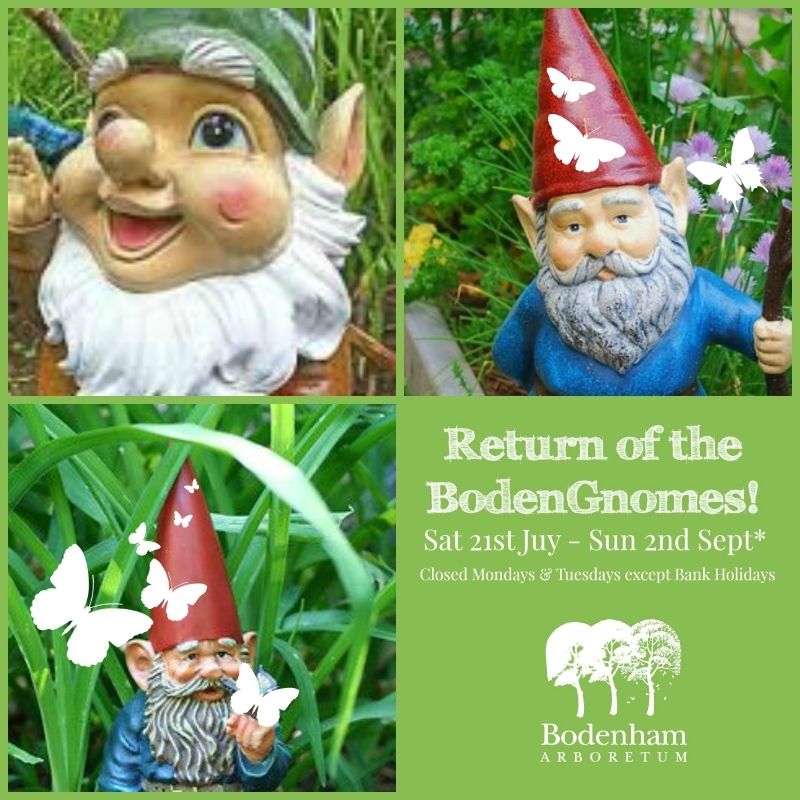 Bodenham Arboretum’s Bodengnome Trail continues throughout the summer, and they also have forest school activities running too. The National Trust have many events running this month. On their website you can find out what is happening near to you. Severn Valley Railway and Land of the Living Dinosaurs at West Midlands Safari Park both continue to run special events alongside their regular openings too. 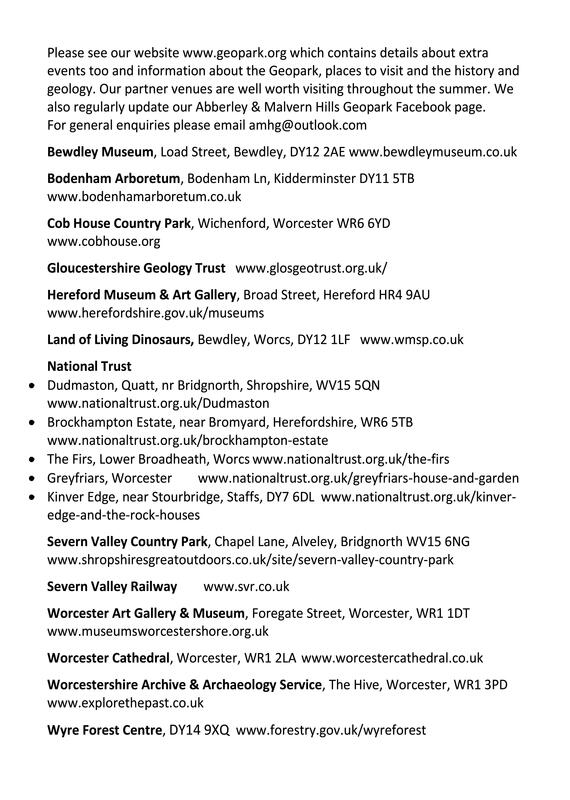 You find out more with our GeoFest leaflet or check out the websites of members below. GeoFest is kindly sponsored by Merlin Energy Resources. 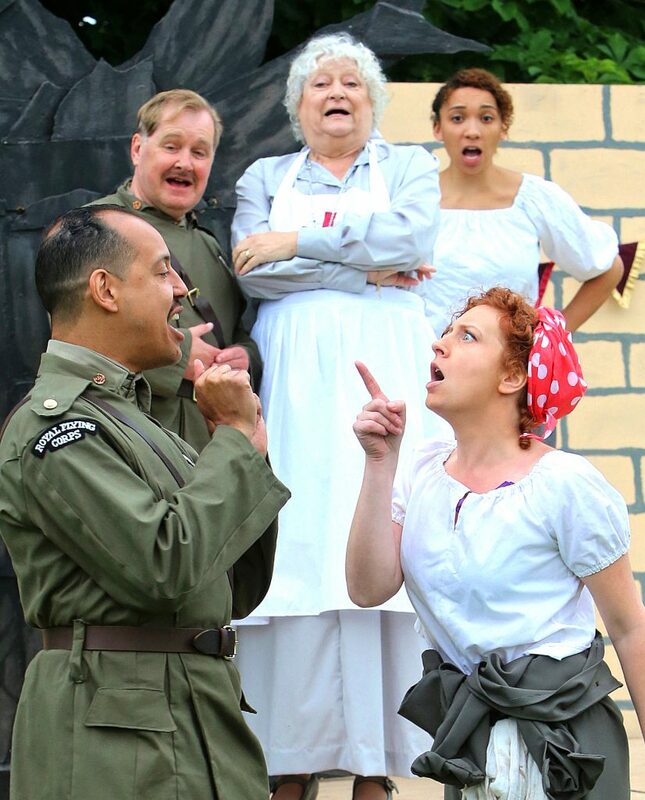 Professional theatre company Rain or Shine are set to delight family audiences once again this summer with their production of Shakespeare’s merry war of words and wit – Much Ado About Nothing. November 1918. The Great War has finally come to end, and the men of the British military forces are returning to their homes. Don Pedro and his comrades are coming at last to Messina (a little known village on the edge of the Cotswolds) where they are met by friends, old and new. Join Rain or Shine Theatre Company this summer, as they visit one of Shakespeare’s best loved comedies. From the dastardly Don John, to the daft Sergeant Dogberry, ‘Much Ado About Nothing’ will bring you revellers, rascals and romance. Featuring the very best of the Bard’s wit and wisdom, the fiery Beatrice gives Benedick, the bachelor, a battle of words to remember, and true love is at its sweetest as Claudio falls for his darling Hero. So dig out your hampers and load up your picnic bags for Rain or Shine’s 20th anniversary of summer tours, as the people of Messina find love, scupper mischievous plots and celebrate new found peace across the world! Audiences are requested to bring along low-backed seating or rugs, and a picnic to maximise their enjoyment of the al fresco performances. Full details of the tour and venues can be found on the Rain or Shine website and tickets can be purchased from each venue, through Ticketweb via www.rainorshine.uk, or by ringing 0330 660 0541. The summer holidays are just about here and there are lots of things happening at the member visitor centres in the Geopark. 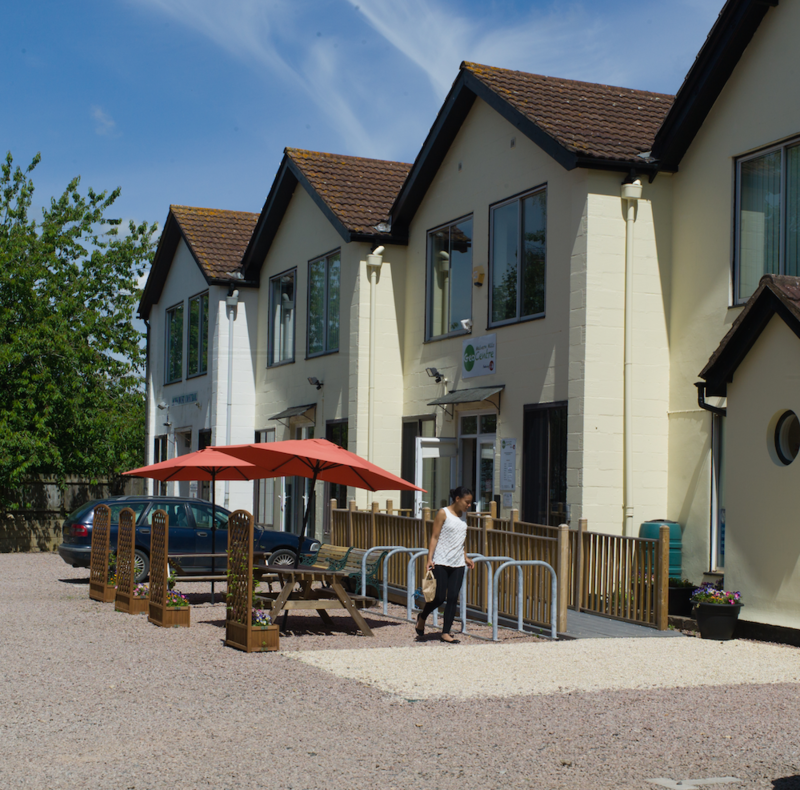 Many are free to visit, with any charges just for parking or refreshments. 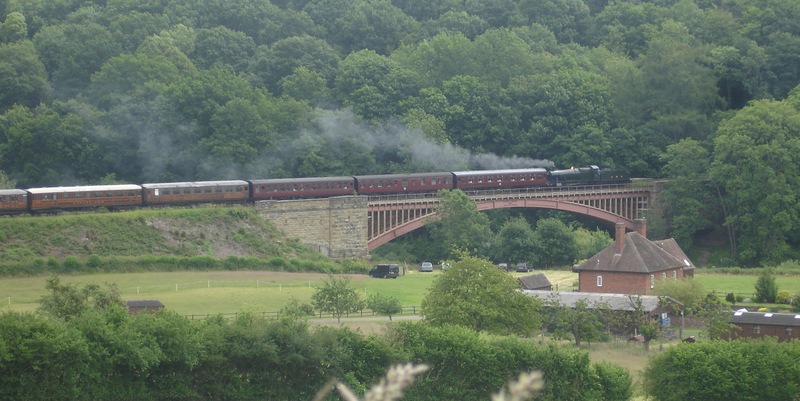 These include Severn Country Park at Alveley, Bewdley Museum, the Wyre Forest, and Cob House Country Park. 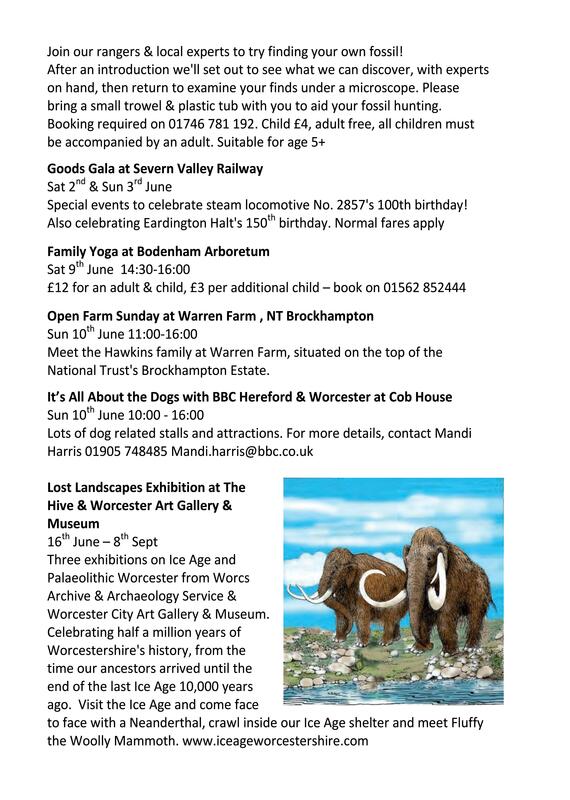 Two great exhibitions all about Ice Age Worcestershire are on all summer at Worcester Art Gallery & Museum and The Hive. Come face to face with a replica mammoth, see real mammoth bones archaeologists have found, go inside an ice age shelter, and stand on a massive map of Britain. 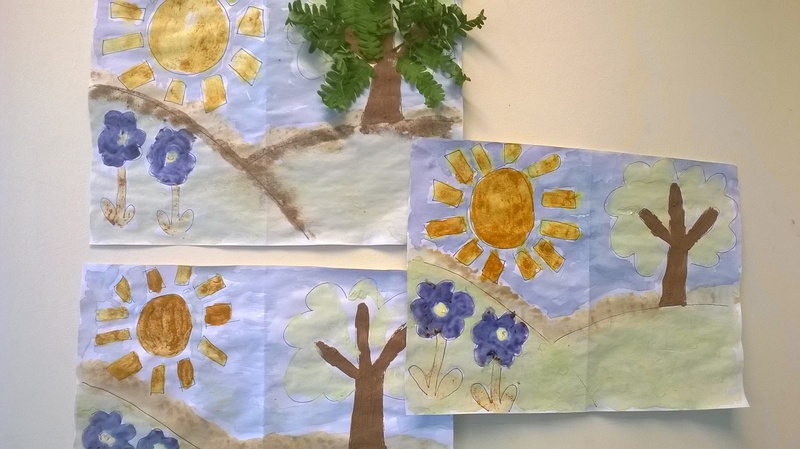 There are also Ice Age themed art activities at both venues over the holidays. 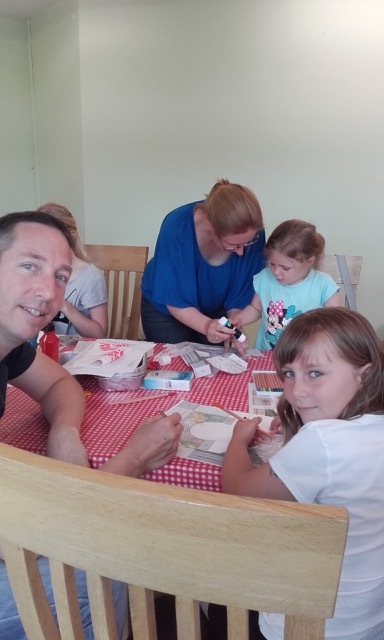 Bewdley Museum has different family art activities each week day. £4 per child, just drop in between 11am and 3:30pm. Entry to the museum is free. 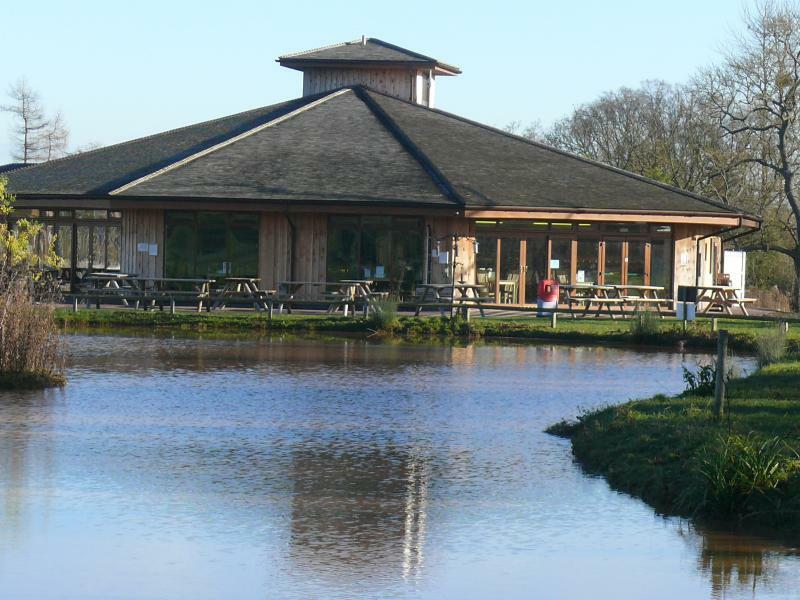 The Cob House Country Park has angling sessions over the summer holidays, and a face painter will visiting some days too. On Sat 28th and Sun 29th July local archaeology groups will be there and you can come and see some of objects they’ve brought along and children can dig in the sandpit to see what they can discover. Severn Valley Country Park has a range of events and activities for the family, some of which are free. 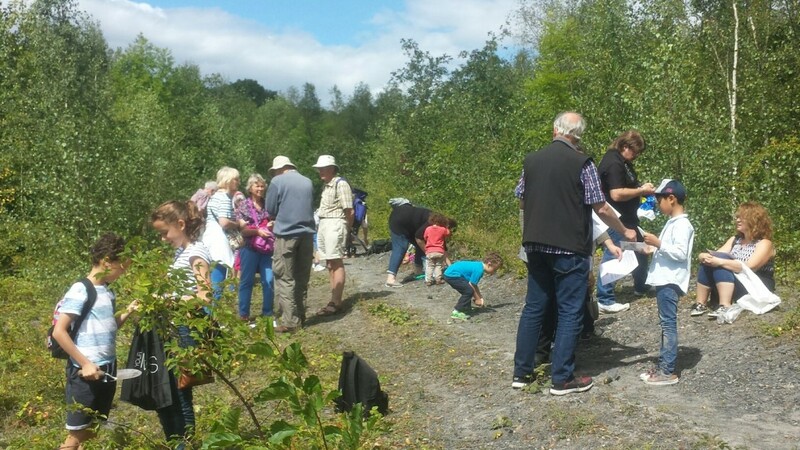 The popular Rock & Fossil hunt is returning Thursday 2nd August at 1:30pm. 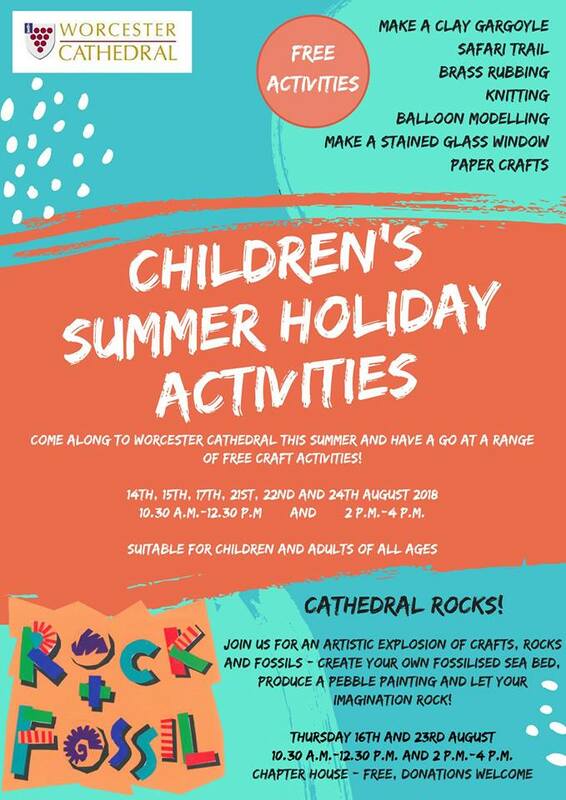 Worcester Cathedral has lots of free craft activities over the summer. 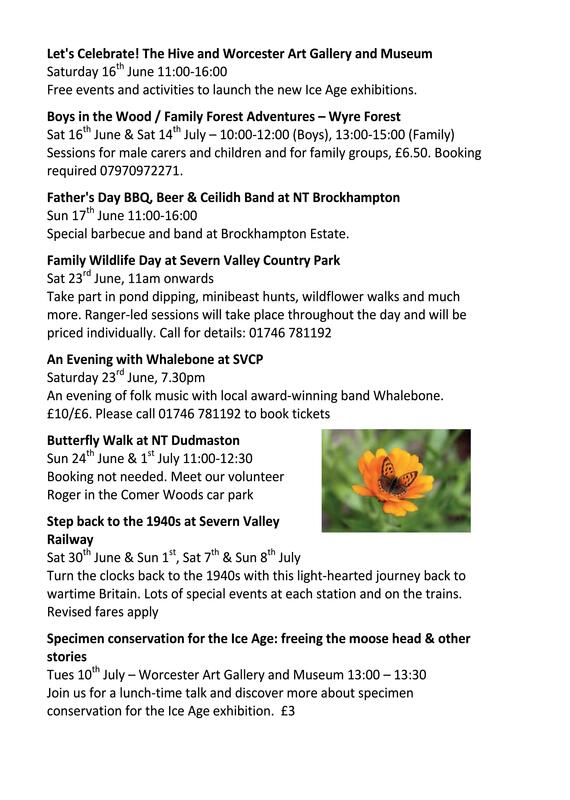 These include some rock and fossil activities in August. We have a number of fantastic National Trust properties in or near the Geopark. 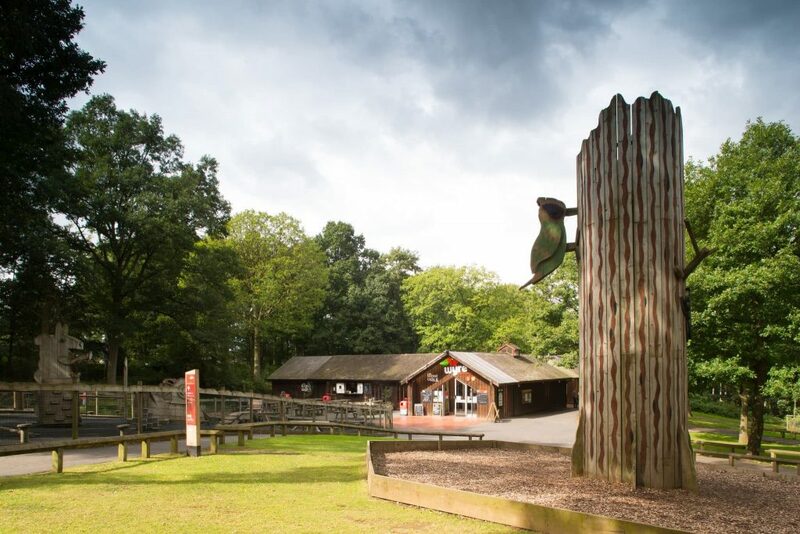 As well as exploring the grounds, getting close to nature and running off some energy you can take part in trails in some of these, such as the 1940s themed trails and games at Brockhampton. 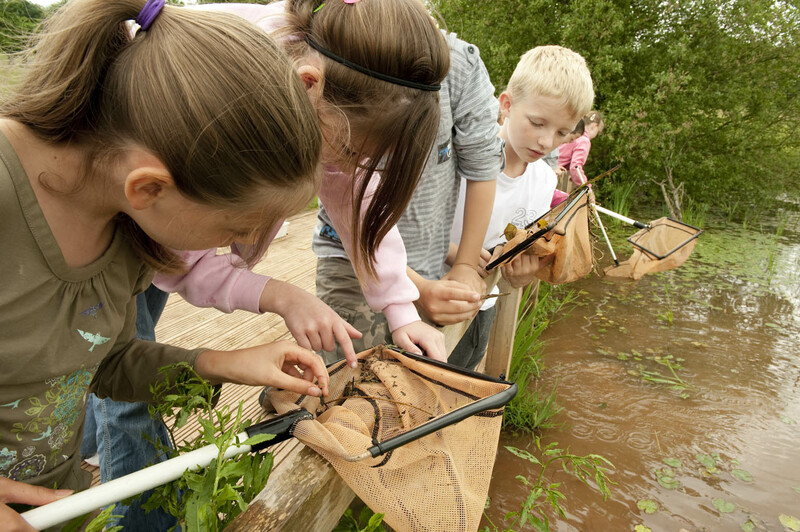 At Kinver they have den building, and Dudmaston have a bat walk, among other great activities. Another site with a trail is Bodenham Arboretum, with their BodenGnome Trail. They also have yoga and art activities, and Forest School activities. Severn Valley Railway and Land of the Living Dinosaurs at West Midland Safari Park are both great days out. Check out their website for special events, including the themed evenings on the railway. These are just a flavour of what you can find. Have a look at our GeoFest leaflet and calendar, and have a look at the websites of our members for more information. Hope you find some great events this summer! 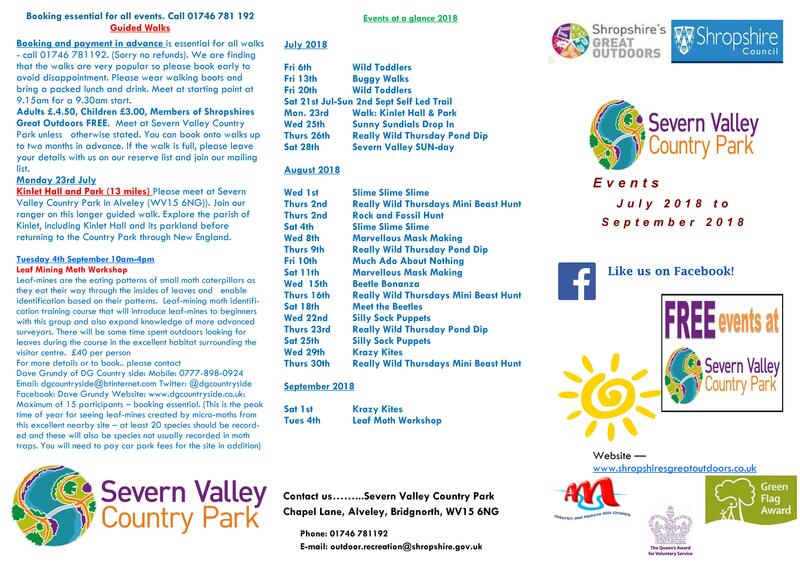 Shropshire Council rangers at Severn Valley Country Park are getting ready for a summer of fun. This year they will be offering more events than before and the great news is that most of them will be free to join! 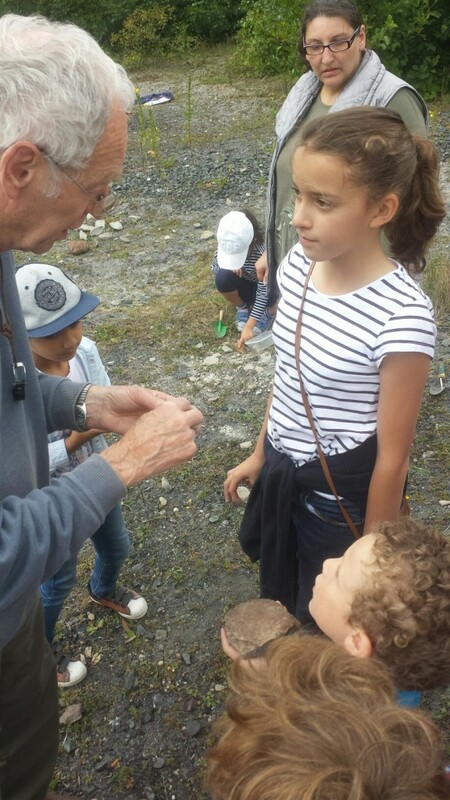 Geologists in the Geopark will be with us on 2nd August for a rock and fossil hunt (Child £4, adult free) and on Saturday 18th August, there will be the chance to meet models of enormous ground, burying and dung beetles (free to all). 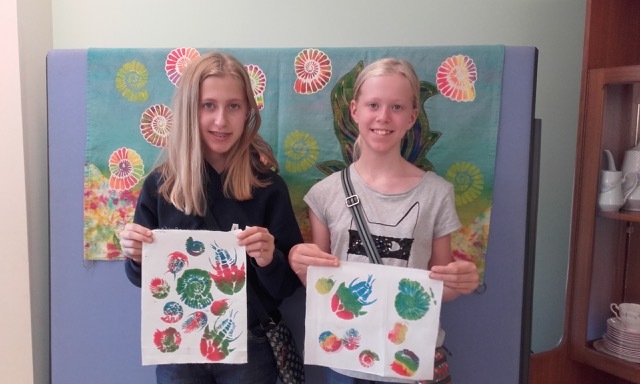 Every Wednesday and Saturday there will be free craft drop in sessions. These will be held in the visitor centre between 12pm and 4pm. 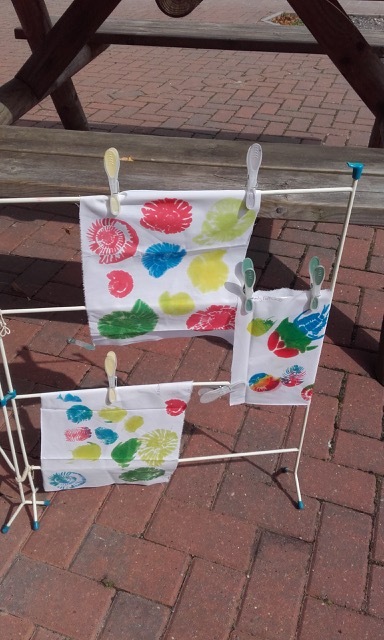 Everything you need will be provided and the kids will be able to make some great items such as sun dials, marvellous masks, slippy slime, krazy kites, silly sock puppets and more. Each Thursday our rangers will be having a really wild time! Free outdoor sessions will start from the visitor centre at 1.30pm. 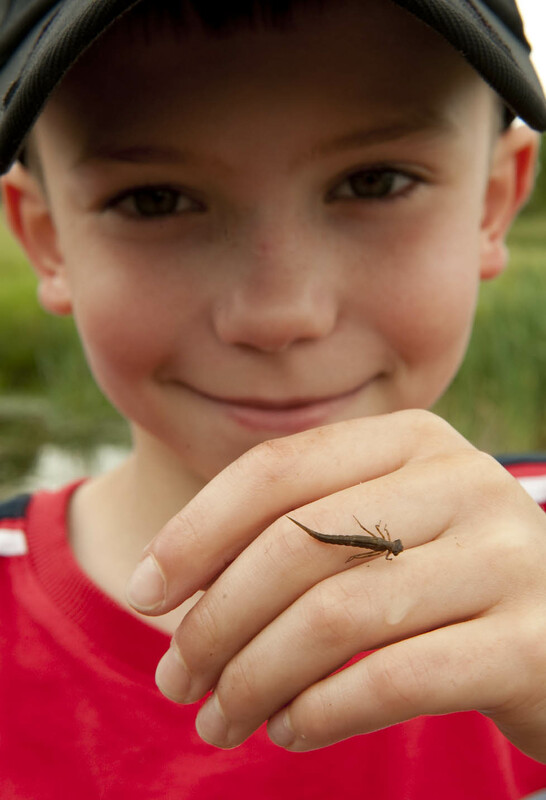 They will alternate between pond dipping and mini beast safaris throughout the summer. Also, on Saturday 28th July, Peter Williamson (BBC Radio Shropshire Astronomer) will be with us to help visitors discover the magic of the sun. From 2pm-5pm, there will be special scopes available in the centre to view the Sun and they’ll be chance to make a stomp rocket with Shropshire Astronomy Group. In the evening there’ll be a talk by Mr Williamson about how the sun works and how to get into solar astronomy (£3 Adult, £2 child). 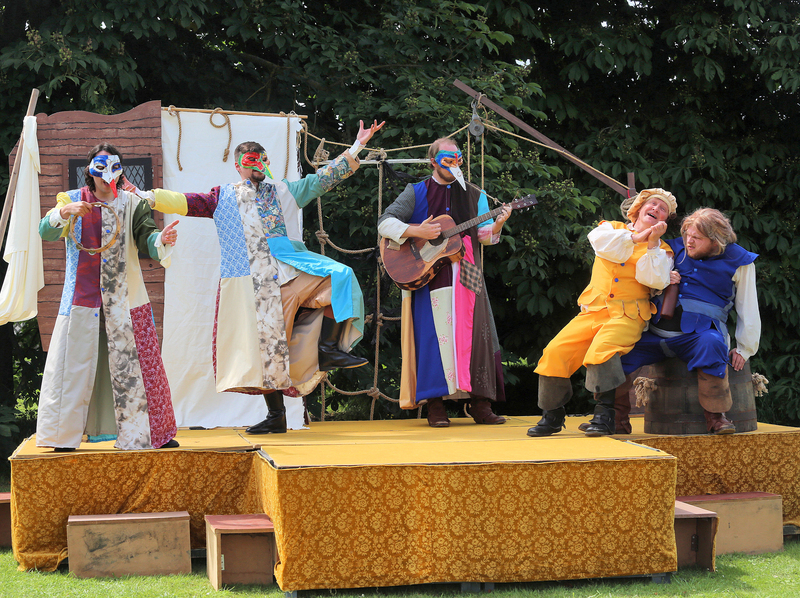 A highlight of the summer is the open air theatre production by Rain or Shine Theatre Company. This year they are celebrating 20 years of touring with a performance of William Shakespeare’s Much Ado About Nothing. The play has been set in the First World War and follows fiery Beatrice and bachelor Benedick on their course to true love. Tickets are on sale now, Adult £14, Concession £12 and Child £6. The visitor centre and café will be open every day of the holidays from Wednesday 18th July to Sunday 2nd September between 11am-5pm. Light lunches, tasty cakes, refreshing drinks and ice creams will all be available. GeoFest is well underway, and with the school holidays approaching there are events happening at many of the visitor centres across the geopark. 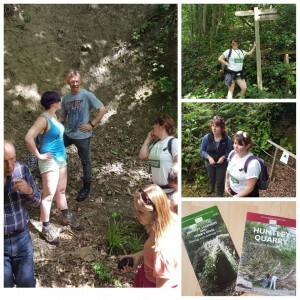 In July the President of the Geopark, Chris Darmon, is leading two guided walks. 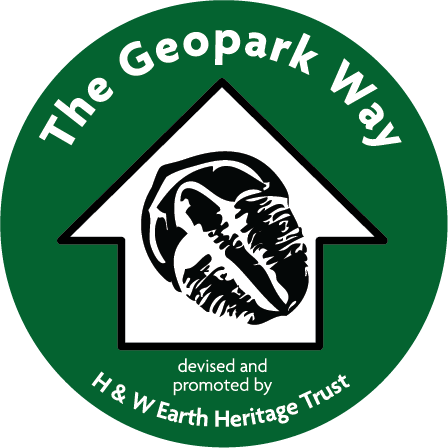 The first is on the Malvern Hills, and the second takes in the Woolhope Dome in Herefordshire, the latest addition to the Geopark. Meeting: Malvern Hills GeoCentre, Wyche, Malvern (WR13 6PJ) at 10:30am. Please bring packed lunch. This Silurian inlier is now part of an extended Abberley & Malvern Hills Geopark. It features folded and faulted Ludlovian rocks including both limestones and shales. 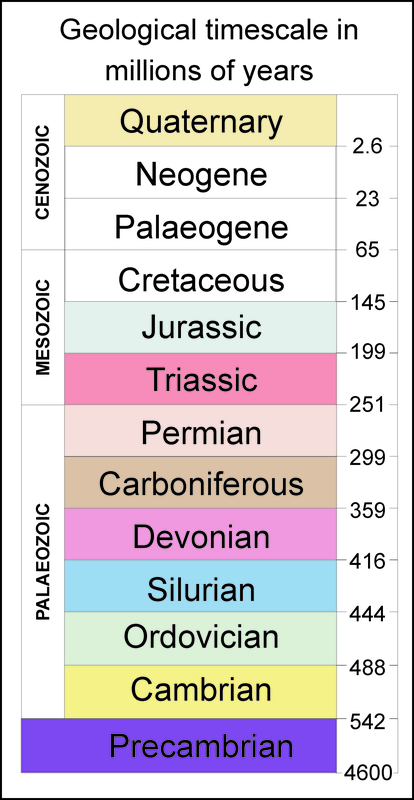 These are fossiliferous and of great interest. You’ve probably seen the Woolhope Dome from many miles away, now you can get up close and personal with it! There’s a new running event where you can have a go racing a stream train! Shropshire Council, StuWeb Events and Severn Valley Railway are organising the race called ‘Steaming down the Valley’ on the evening of Thursday 28th June. The off-road route will follow the Severn Way between Severn Valley Country Park and Arley Station, a distance of around 3.5 miles. 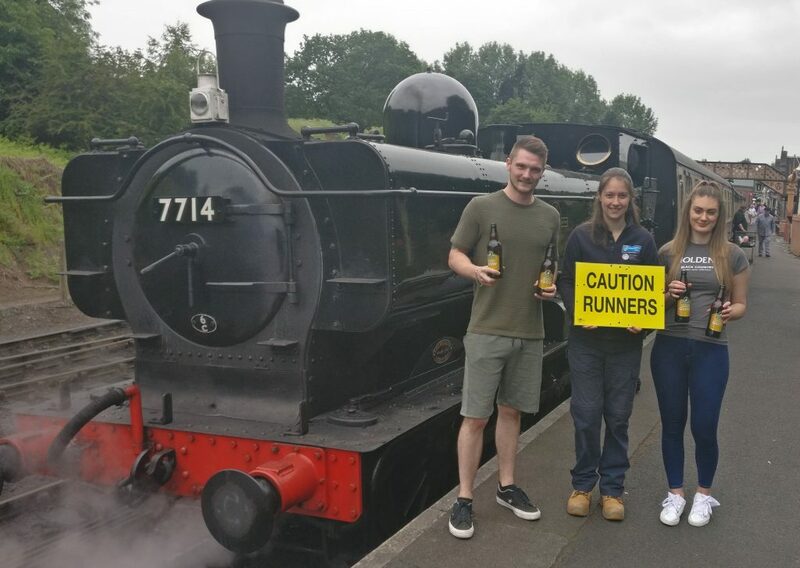 The Golden Lion pub in Bridgnorth, owned and managed by Holdens Brewery, has sponsored the new running event meaning that runners can enjoy a refreshing pint of Holdens Golden Glow after racing a steam train down the Severn Valley! There will be two heats (one starting at approximately 7pm and one starting at around 8pm) and registration is at Severn Valley Country Park in Alveley. 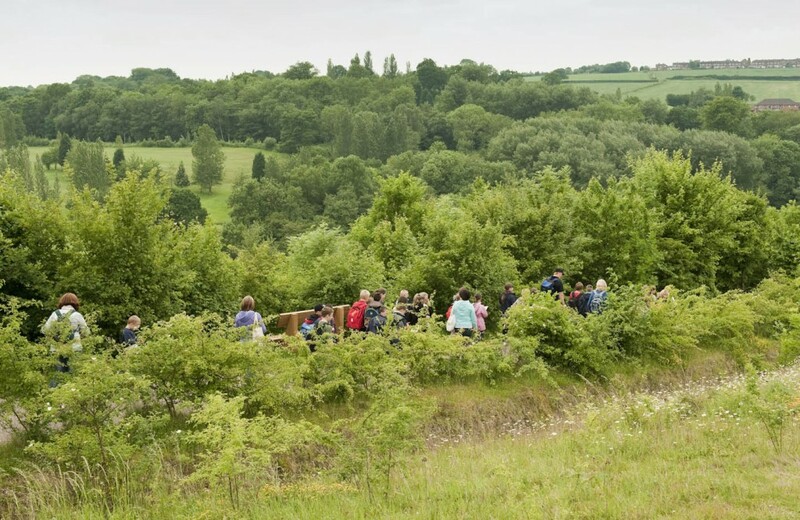 The team at Severn Valley Country Park would like to invite visitors to join them on a guided wild flower walk on Saturday 9th June and Sunday 17th June, 2pm-3pm. Usually at this time of year, their lovely Spring Pieces wild flower meadow is in full bloom with beautiful displays of common spotted orchids, ox-eyed daisies, buttercups, yellow rattle and, on occasion, adder’s tongue fern. Severn Valley Country Park is definitely the place to discover a large selection of native wild flowers. 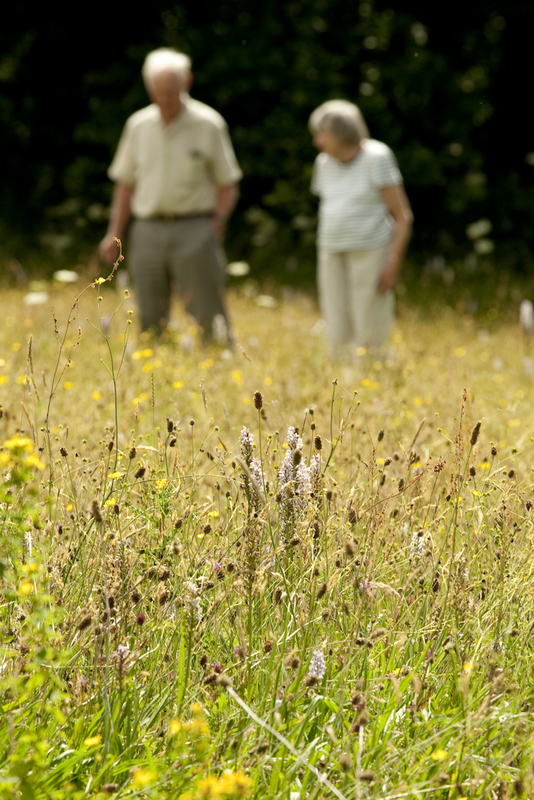 The walk will be easy paced with plenty of stops to look at the wild flowers and wild life on the walk to the meadow. There will be plenty of opportunity to take photographs of the flowers so please bring your camera. The knowledgeable guide will identify the different species for you and give you tips to help you improve your own ID skills. Please dress for the weather and wear sturdy shoes. 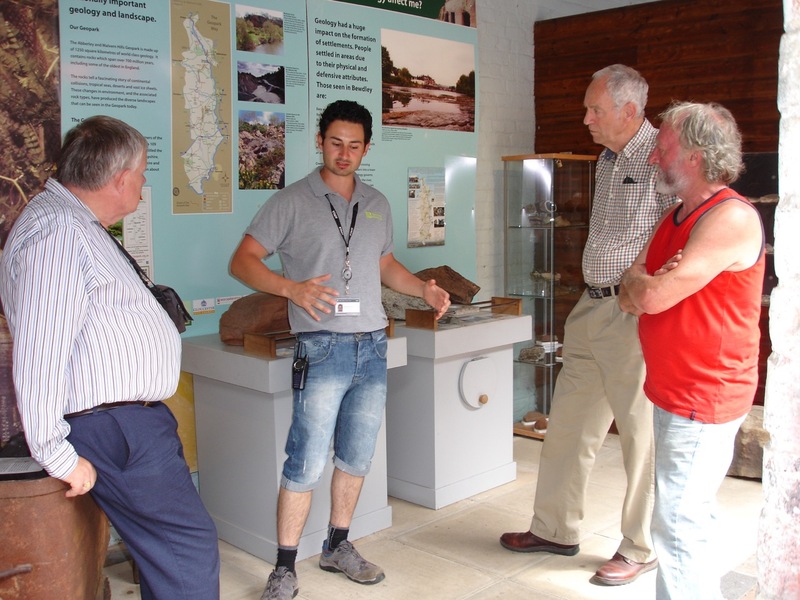 Meet at the visitor centre at 2pm on Saturday 9th June and Sunday 17th June. Booking is advisable (please call 01746 781 192), but do feel free to turn up on the day. GeoFest will be running from 26th May, starting with a exhibition at Severn Valley Railway’s Kidderminster Station over the Bank Holiday. GeoFest 2018 will run throughout June, July and August. Plenty for all the family to do. Look out for the full programme nearer the time. 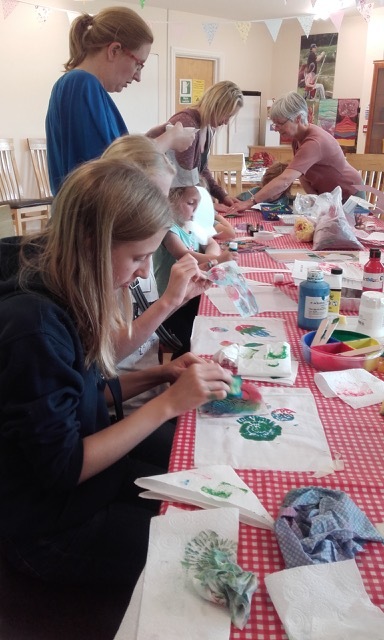 Geologists in the Geopark helped with this event at the Cob House, with attendees having a go at creating textile designs inspired by the geology. GeoFest 2017 will close on Saturday 2 September with a guided Geological walk to explore the building stones of Gloucester’s high street. Dr Alice Kennedy from the Gloucestershire Geology Trust will be explaining more about the key stones which form the colourful high streets of Gloucester. The walk is free but must be booked in advance. Please ring 01452 864 438 or email info@glosgeotrust.org.uk to book your place by Friday 1st September. Walk will start at 10.30 at Gloucester Cathedral, the south porch off College Green and Westgate Street and last 1-2 hours. Worcester Cathedral are running their annual Discover Something Different starting tomorrow with a range of tours, exhibitions, recitals and family activities. Throughout the period there is an exhibition looking at how the cathedral was built and the many craftsmen who were involved. 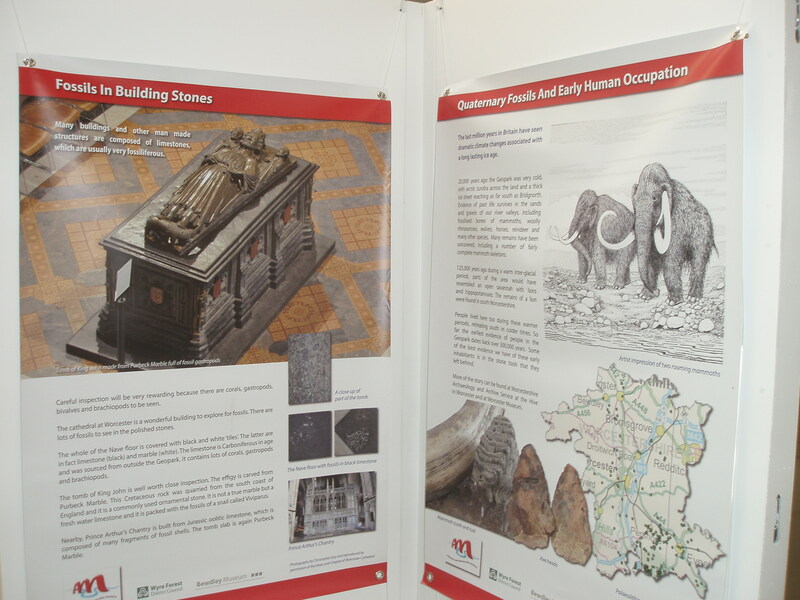 You can also catch our Geopark exhibition here. On Wednesday 23rd August Geologists in the Geopark will be leading a tour highlighting the geology which can be seen and which you may just usually walk pat. Be inspired and captivated this August by our tours, talks and exhibitions. Please click on this link to access the full programme including dates and times of each event. Prices are listed below. All tickets are available from Worcester Live Box office online or by phoning 01905 611427. Remaining tickets on the day will be sold through the Cathedral Shop. Try your hand at designing a stained glass window, illuminating a medieval manuscript, modelling a clay gargoyle and brass rubbing. A guided tour of historic Worcester Cathedral, led by one of our experienced Cathedral Guides. The tour will last approximately an hour. Meet in the Cloister outside the shop. On the following dates (and times) in August Turn up for a Tour will be replaced by an alternative tour (see below for details of the other tours) – Sat 12th 2.30pm / Mon 14th 2.30pm / Tue 15th 2.30pm / Sat 19th 2.30pm / Mon 21st 2.30pm / Tue 22nd 2.30pm / Wed 23rd 2.30pm / Thur 24th 11am / Sat 26th 2.30pm. See the Cathedral from a different perspective! Guided tour given by the Cathedral Archaeologist, or one of his knowledgable assistants, through some of the Cathedral roof spaces. N.B. Due to the ancient nature of the building and spiral staircases there is no disabled access. Not suitable for under 16s. Guided tours of the Cathedral’s atmospheric medieaval library offering a chance to see the Worcester Anitphoner and other mediaeval manuscripts, historic documents and rare books from the Cathedral archives. King John’s Tomb in the Cathedral Quire is a stunning setting to hear about his life, disputes and the lead up to him sealing Magna Carta 800 years ago. 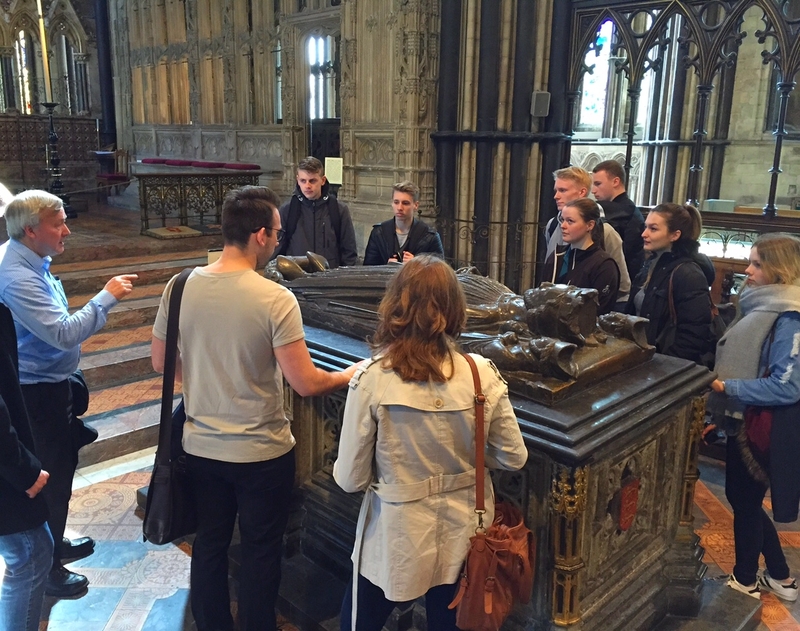 Learn in more detail about the people connected to and buried in the Cathedral. Hear about their fascinating lives, loves and losses. A chance to meet the Cathedral Gardener who will point out to you the trees and plants of rare and special interest in the Cathedral and Deanery gardens and the different herbs in the Cloister Garth garden. This free event is a great opportunity to hear beautiful music and observe conductors learning their skills, set in the centre of the Cathedral on The Crossing or in College Hall. A programme of beautiful choral works including Brahms, Elgar, and Verdi will showcase the Voces masterclasses that have taken place throughout the week. Conductors will be joined by special guest Choir Evoke in this closing performance. Hear the moving and poignant stories behind some of the men who fought in World War I, who are commemorated in the Cloister windows and who were connected to the Cathedral. Climb the 235 steps up the Cathedral Tower where on a clear day you can see spectacular views over the city centre, River Severn, county cricket ground, Pitchcroft, Fort Royal, Malvern and Abberley hills and the beautiful Worcestershire countryside beyond. Small children must be able to climb independently and be supervised by an adult (the tower is very narrow and steep). Should the tower not be open due to the weather, Worcester live tickets can be used on an alternative day when the tower is open.Tickets will also be available at the Cathedral shop in the Cloister and from the ticket / donation point near the north door on the day. Stand where Charles II watched the progress of the Battle of Worcester on 3rd September 1651 and let our guide take you back in time to hear about this decisive battle of the English Civil War. A tour of the teaching centre, ringing room and Belfry. See the bells being rung and meet some of the Bellringers. Meet at the Tower entrance. Hear about the Benedictine monk’s life from 500-1000 years ago and see the surviving and ruined Monastic buildings on the tour outside and in the Cathedral. The cathedral was built with many different rocks but did you know that many of these stones have wonderful fossils within them. During this gentle stroll around the Cathedral you will see fossilised corals, snails and sea lilies in rocks that are up to 350 million years old. You may find that a small torch and magnifying glass will make your tour a little more enlightening. Worcester Cathedral has been described as possibly the most interesting of all England’s Cathedrals from an architectural point of view and has examples of wonderful stone work and architecture from Saxon through to Tudor times. 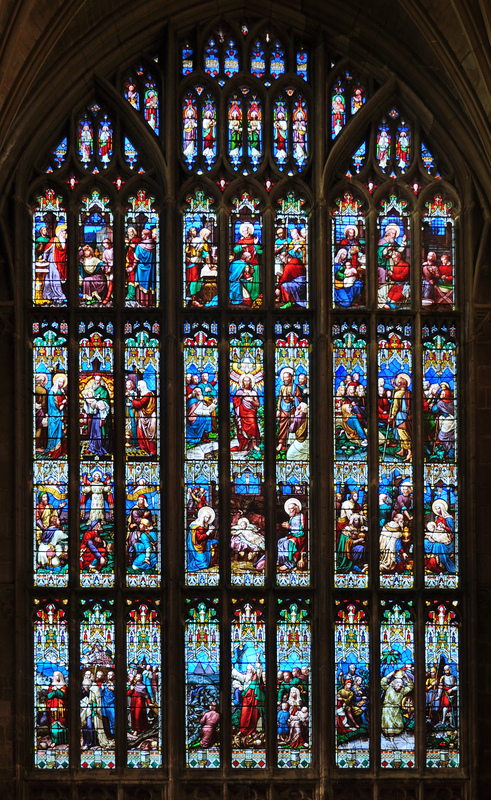 Worcester’s magnificent Stained Glass tour includes the inspiring Great West Window depicting the creation (currently being conserved), the East Window showing the life of Christ, and among others the Edward Elgar and Charles Hastings windows. 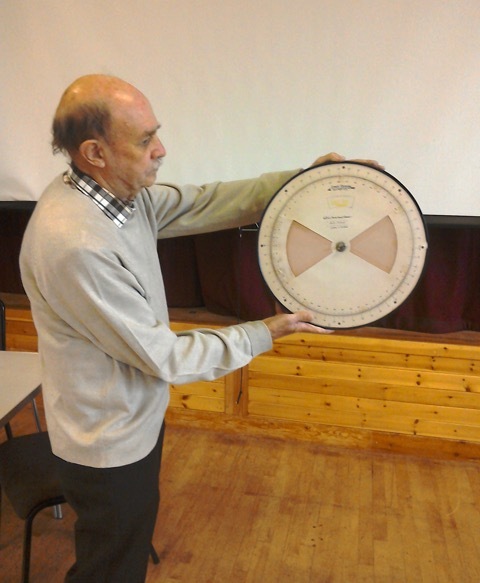 A talk on the restoration and conservation of stained glass by specialist Steve Clare of Holywell Glass. The talk will take place in the Nave of the Cathedral, in sight of the Great West Window and the glass conservation work. The event includes a glass of wine or a soft drink prior to the talk beginning. Meet some of the skilled glass conservators from Holywell Glass whilst they work on restoring glass from the Great West Window. 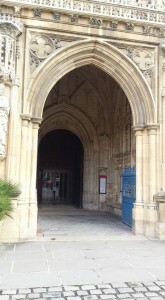 They will be demonstrating their craft at work benches at ground floor level in the Cathedal Nave. A fascinating exhibition looking at how the Cathedral was constructed from the middle ages onwards and at the various types of medieval craftsmen. 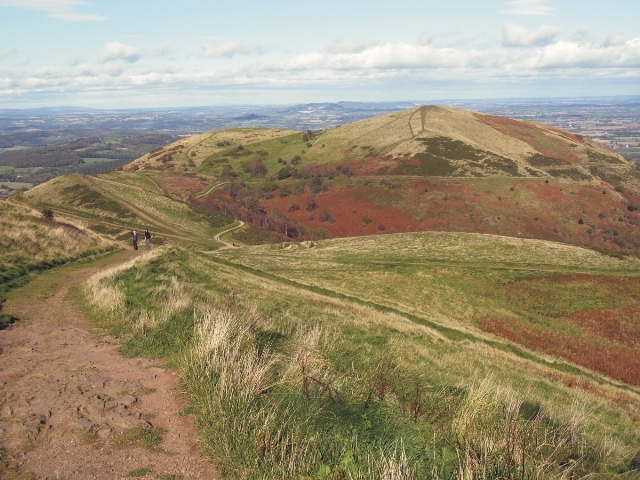 The Abberley and Malvern Hills Geopark has an abundance of fossil bearing rocks that form the local landscape. This exhibition tells the story of fossil corals, trilobites ammonites and dinosaurs from as long ago as 400 million years right through to the last Ice Age and which can be seen in the fabric of the Cathedral. An exhibition of eight large scale vibrant abstract paintings inspired by the house and gardens of Winterbourne Edgbaston. The Safari Trail leads younger children around the Cathedral looking for the many animals that can be found in the stained glass windows, floor tiles or carved on tombs. Children are welcome to borrow a special safari backpack to go on safari with binoculars and a torch to make their journey extra special. 4 beautiful designs to colour designed by Local artist Sara Hayward in the serene and calming environment of the Lady Chapel. Colouring sheets, pencils and clipboards available in the Lady Chapel. 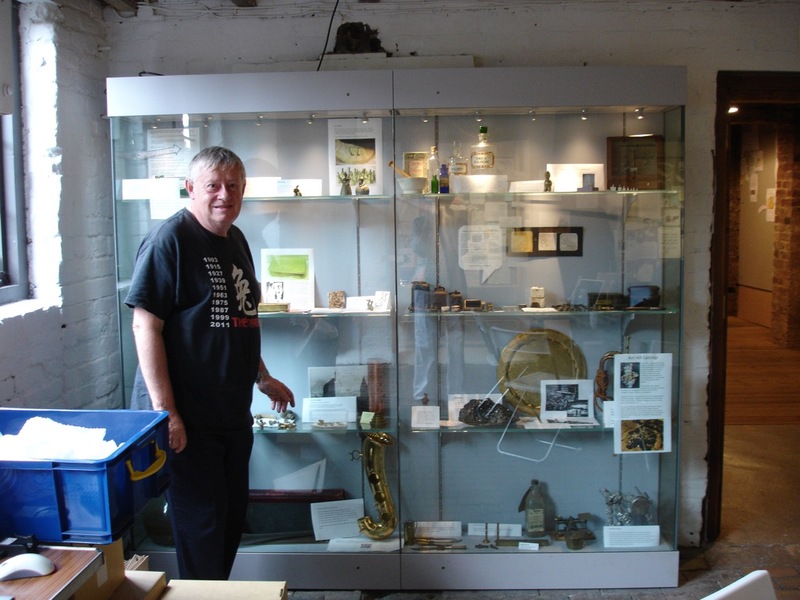 On Saturday 12th August Gerry Calderbank will be giving a talk at Bewdley Museum. He’ll talk about how the surveyor’s levelling practice and technology has developed from Ancient Rome to the present day – thereby giving rise to the metric system en route. We asked Gerry to say a little more about it. “In the 1960s Herefordshire had no ‘County Archaeologists’ nor support structure; instead, there was reliance upon various local museum, university and/or WEA staff et al. for dealing with the rescue digs – people like the late Frank Noble and Stan Stanford for example. So digs tended to be in their own spare time (weekends and vacations) and relied upon lots of volunteers such as ourselves in he W.A.R.S. 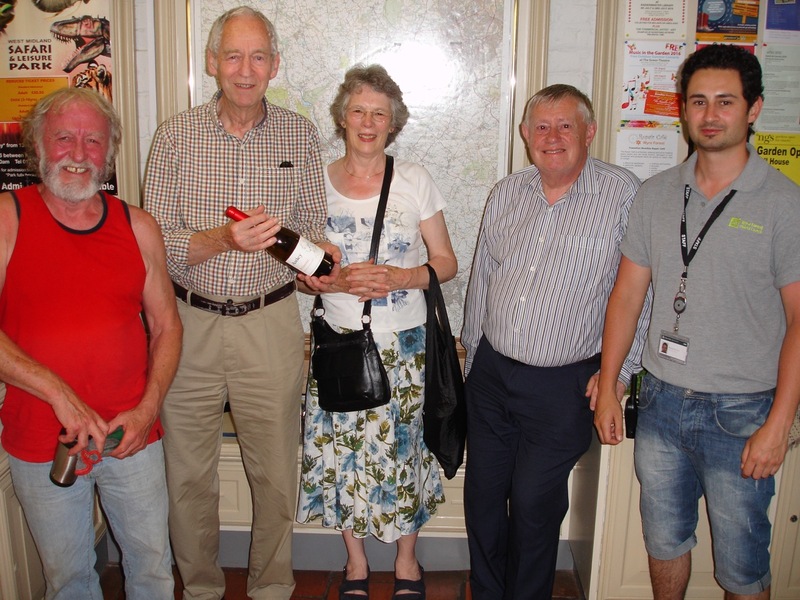 – plus the Archenfield Archaeology Group, of course. Consequently, there was never much time for anything much more than the digging and tidying up afterwards. I mostly assisted Stan Stanford – on mainly Iron Age and Romano-British sites (the various hillforts such as Croft and Midsummer Hill, or our three Leintwardine rescue digs spring to mind) plus a couple of Neolithic sites and the Bronze Age urnfield at Bromfield, etc., etc. Stan was always pushed for time and, instead of booking his levels in a conventional way (Surveyor’s Notebook) Stan scribbled all the data on his field sheets as we worked (Sopwith staff foresight & backsight readings) and these were left for conversion during the long winter evenings. He lived in Luston and I used to drive over on such evenings from Burford (Salop!) to help Stan and Yvonne with the conversions and any other jobs like like washing finds, etc. One such evening we took a break from the tedium and Stan remarked that there must be some more efficient way of doing things. This set me thinking. It was a pre-digital era of course – not even pocket calculators! – but I was familiar with certain engineering techniques and (from my work) with so-called ‘Modern Mathematics’ and I realised that the simple arithmetic we were doing (subtracting staff readings from the backsight data) was actually an “iterative process” in mathematical terms – and could therefore probably be mechanised in some way. So, to cut a long story short, I invented and built a simple form of circular slide-rule (an analogue computer) which we then used on-site when levelling. It was calibrated in Imperial measure and, when set up (“zeroed”), you could subtract the foresight readings instantly to the nearest tenth of a foot ASL (our normal Imperial usage). Professional theatre company Rain or Shine, hailed by ‘The Stage’ as “one of the best companies touring open air theatre” are set to delight family audiences once again this summer with their production of Shakespeare’s cross-gartered and hilarious cross-dressing comedy Twelfth Night, as they ‘transport’ you to a land where nothing is quite what it seems. Sure to delight family audiences from 6 to 96, this is an ideal choice for an outdoor theatrical event, bringing classical theatre into the heart of local communities as they travel across the UK during June July and August from the Devon to Northumberland, and Wales to Norfolk, visiting some of the country’s most picturesque castles, stately homes and gardens along the way. The tour includes a performance at Severn Valley Country Park, Alveley on Friday 11th August at 7.30pm. Tickets are available in person from the venue, by ringing 01746 781192, or directly from Rain or Shine on 0330 660 0541 or go online via www.rainorshine.co.uk. Audiences are requested to bring along low-backed seating or rugs to maximise their enjoyment of the al fresco performance. Full details of the tour and venues can be found on the Rain or Shine website and tickets can be purchased from each venue, through Ticketweb via www.rainorshine.uk, or by ringing 0330 660 0541. On Saturday 29th July 2017 there is a Textile Craft Day – for the whole family. Print a fossil stencil, build a fiery volcano or a chilly glacier. Demonstrations of fabric painting, printing and stencilling. Try out these techniques for yourself and see how fossils and rocks can be used as an inspiration for arts and crafts. Worksheets will be provided for visitors and children to take away for follow-up activities’. This is a GeoFest event by ‘Geologists in the Geopark’ and led by Georgia Jacobs. The event runs from 10:30am-3:30pm. There is no charge although donations on the day will be welcomed! Children must be accompanied. 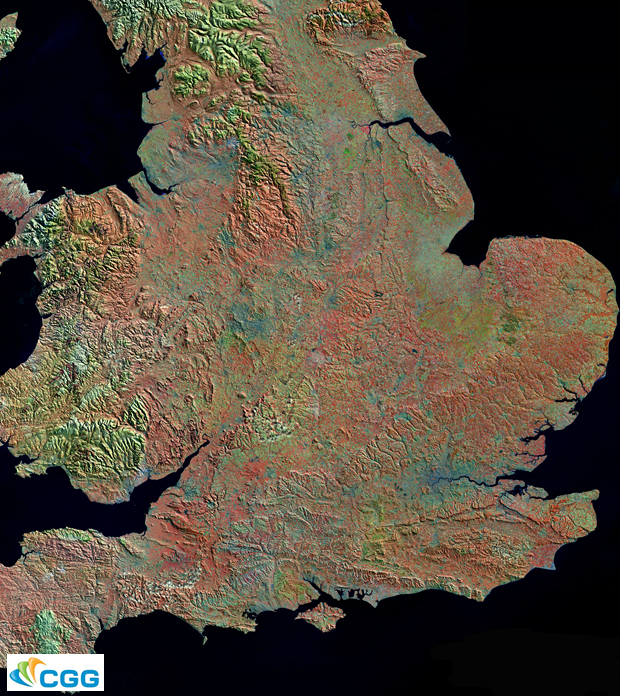 Stunning Landscapes from Space – how satellites see the Geopark. This is an exhbition running at Bewdley Museum from Saturday 22 July – Sunday 24 Sept. Space satellites now provide exquisite photographic detail of the Earth’s surface. This exhibition shows your local landscape of hills, rivers and rocks as never seen before. 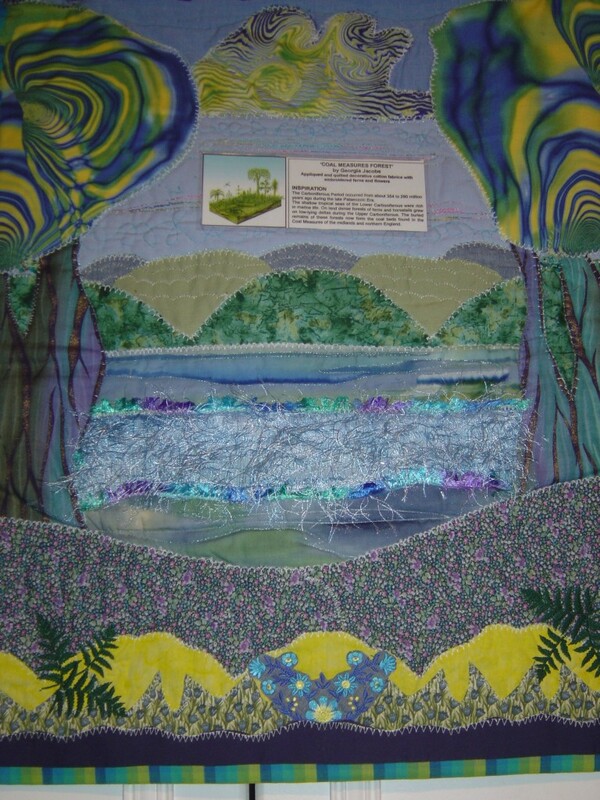 On Sunday 23rd July Georgia Jacobs will be running a Geology/textile demonstration at Bewdley Museum to coincide with the launch of her Lines in the Landscape exhibition. demonstrations for the visiting public. Georgia will also be at Malvern Hills GeoCentre on 29 July and Cob House on 24 August (booking required 01886 888517). 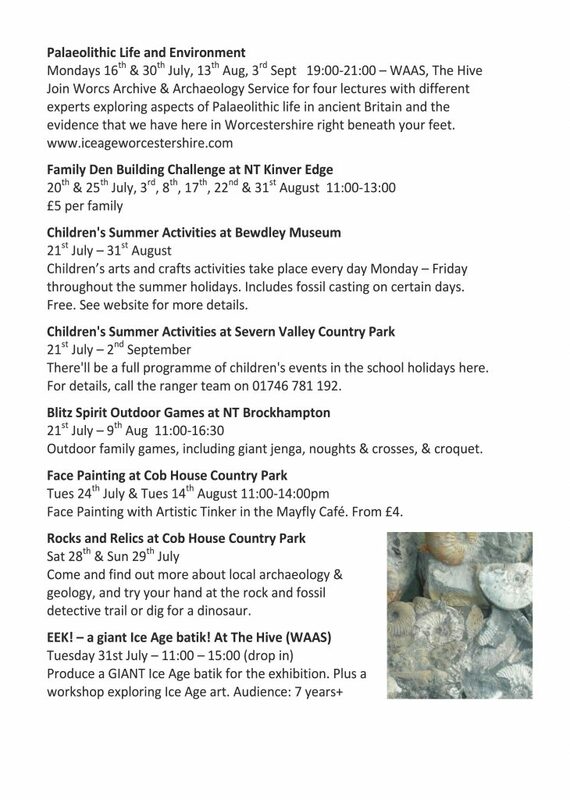 On Monday 31st July & Saturday 5th August take up theRock & Fossils Challenge at Bewdley Museum. 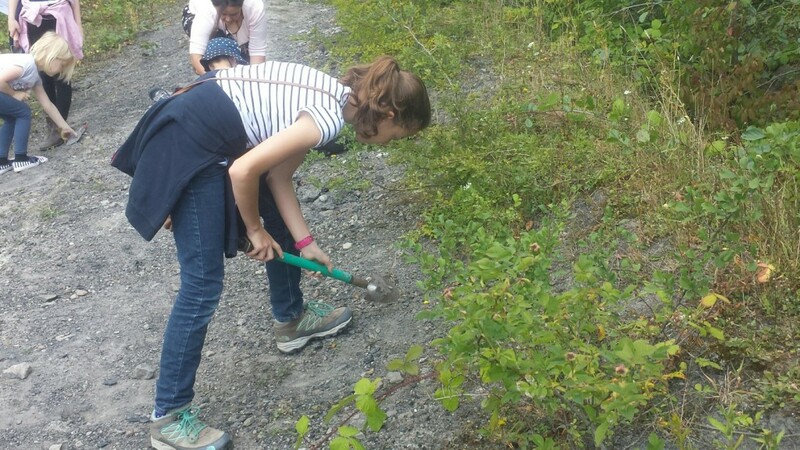 Become a fossil hunter – find and identify hidden fossils. Bring in your own specimens for experts to identify. It runs 11am-3pm and is free. 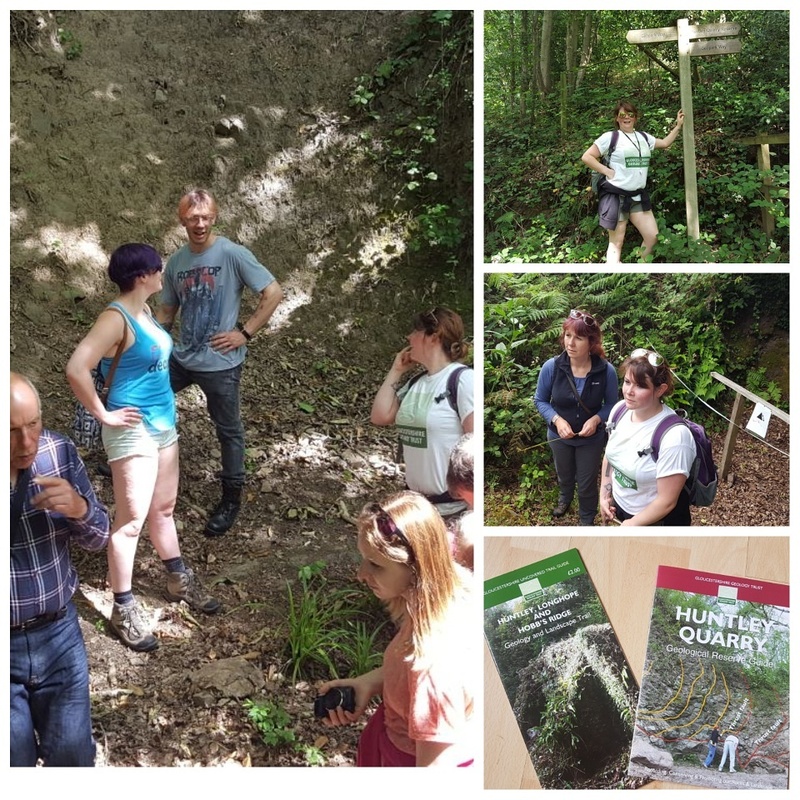 On Saturday 24th June Gloucestershire Geology Trust led a walk at Huntley Quarry where they explore the geology of the site. They have another event for GeoFest on Saturday 2nd September when they’ll be leading a walk in Gloucester discovering the building stones of Gloucester. It’s a free walk and can be booked through 01452 864438. Before then there is an 8 mile walk at Trimpley reservoir & Eymore Wood on Monday 17th July if you’re interested in guided walks. 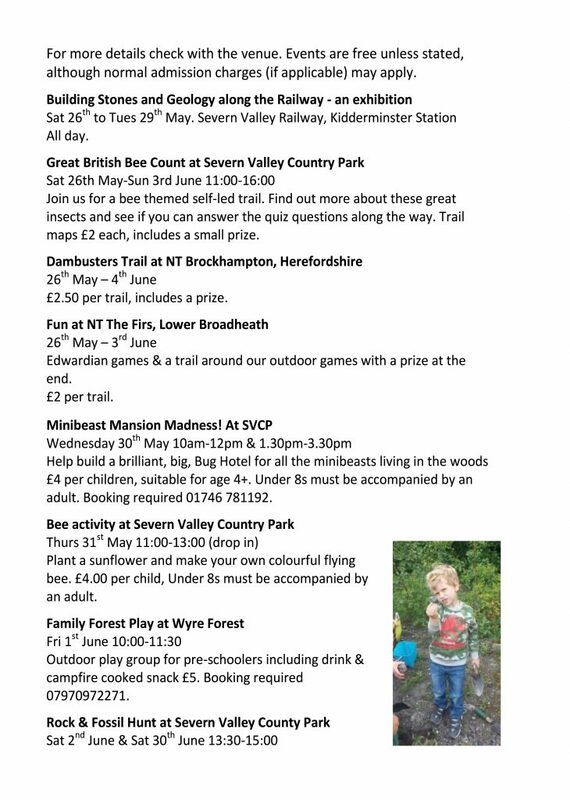 It’s arranged by Severn Valley Country Park. Booking essential, please call 01746 781192. Adults £3.50 Children £2.00. 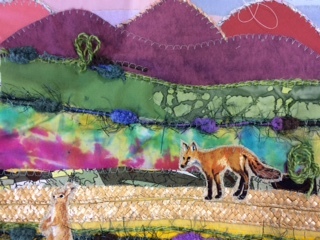 As part of this year’s GeoFest artist Georgia Jacobs is running a number of events based around creating textiles inspired by geology and the landscape. 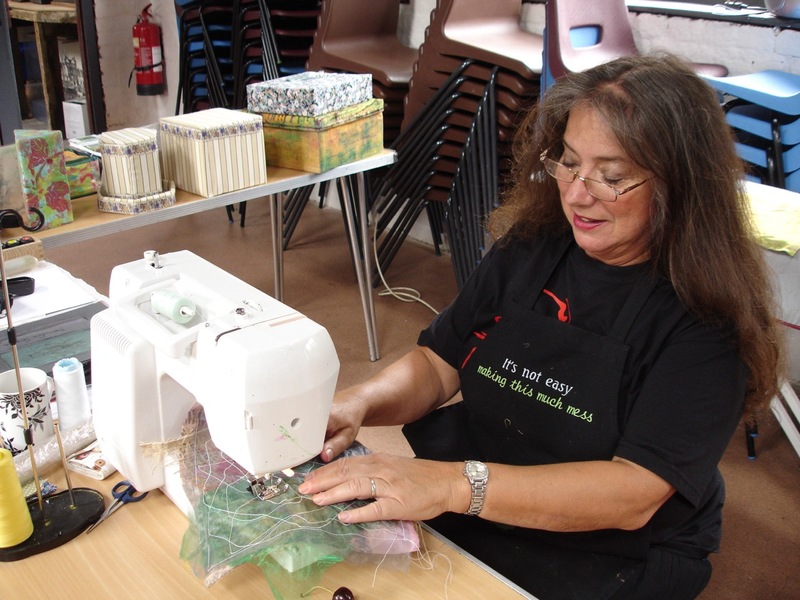 Recently she was at Severn Valley Country Park and a number of people had a go at a workshop and thoroughly enjoyed it. 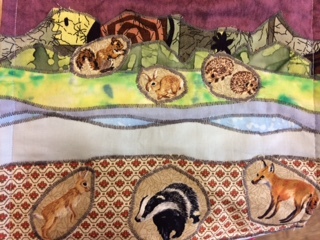 You can see more of her textiles at Bewdley Museum as part of an exhibition from Saturday 22 July through to Sunday 24 September and entry is free. As part of the launch she will doing demonstration on Sunday 23 July from 12-3pm. information on this and call 01886 888 517 to book into the sessions so that we can secure you a place on this very popular event. For the last 7 days a GeoFest event at Severn Valley Railway has been promoting ‘A Train Ride Geology Trail’. Over 400 people took up the challenge and tried out the trail from the comfort of their seat on the train. 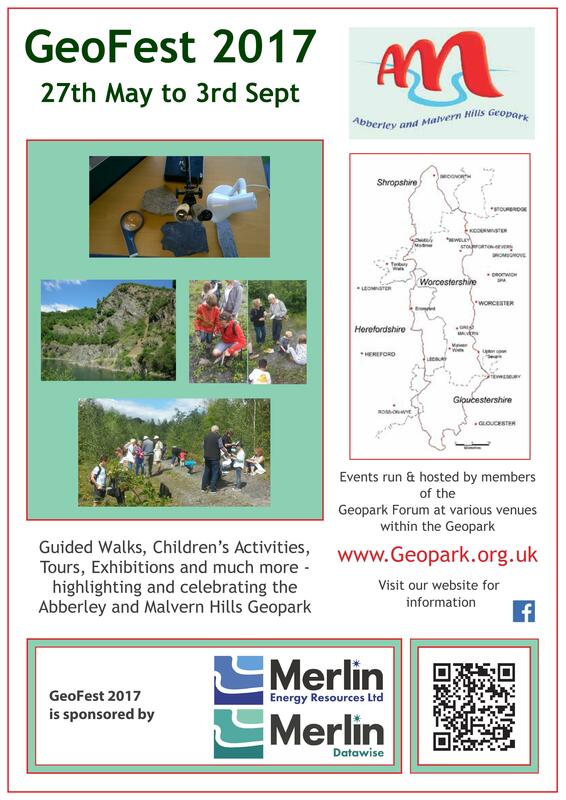 The free guide can be downloaded from the Geopark website. The 2017 GeoFest is about to begin, and an exiting range of events from the Geopark partners can be found on our new leaflet. Walks, workshops, outdoor theatre and children’s activities are just some of the events on offer. 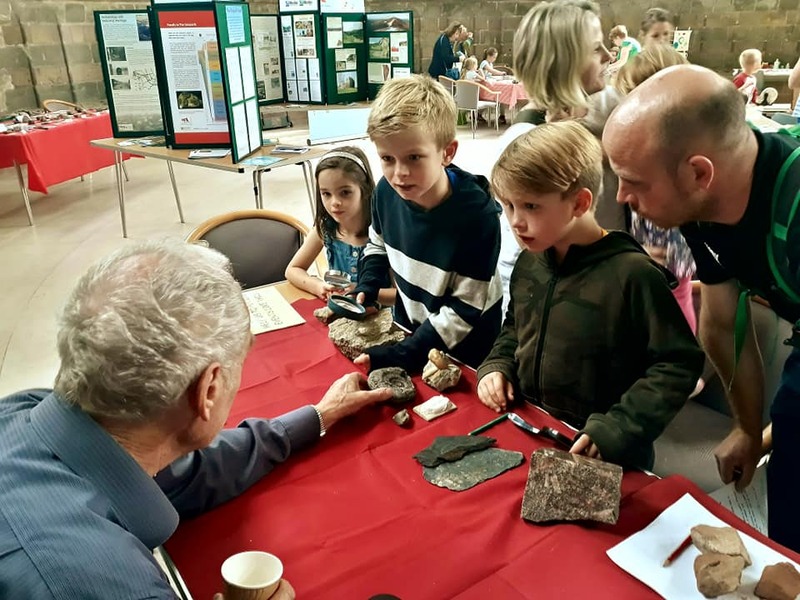 It all starts this weekend with Fossil Days at Bewdley Museum where you can meet some experts who have brought a range of fossils along and will happily explain to you what they are and answer questions. You can download the leaflet here – GeoFest 2017 leaflet and stat planning some exciting days and evenings out. GeoFest 2017 kicks off with a fossil friendly weekend at Bewdley Museum. 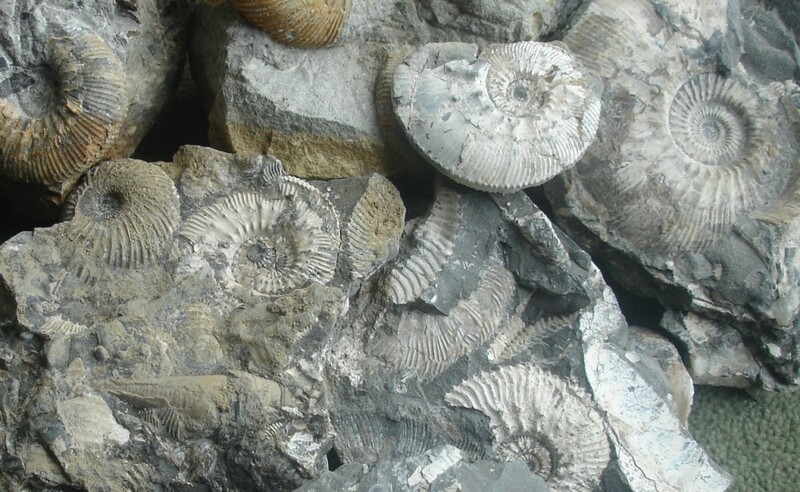 On Saturday and Sunday 27th and 28th May come to the Museum and make your own fossil cast and also see some of the real fossils from the Museum’s collection. This year’s GeoFest will take place between Saturday 27 May to Sunday 3 September. Nearer the time we will be sharing details of the exciting events being offered by our partners. 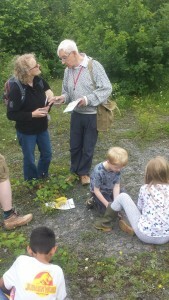 Another two successful rock and fossil hunts round off a great summer of geology at Severn Valley County Park. Both days received a great turnout of young budding geologists, and with the industry experts on hand, it was no wonder the days were full of excitement and learning. 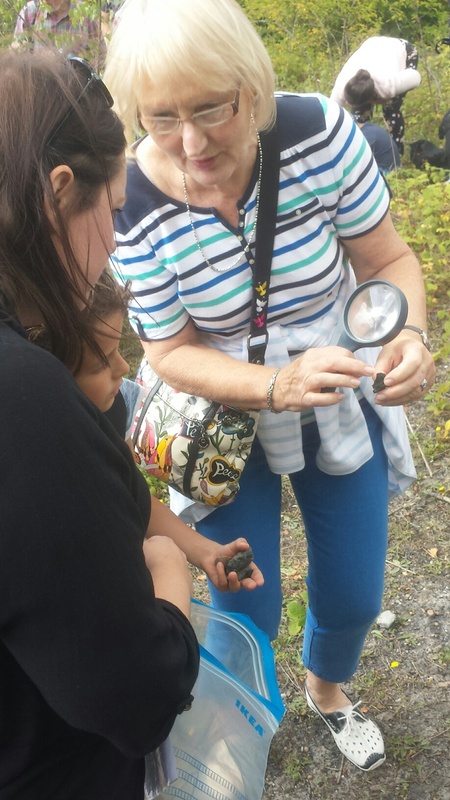 The young fossil hunters identified different rocks such as Sandstone, Limestone, Coal, Dolerite and Quarts. Some were lucky enough to find fossilised plants and shells in their rocks! 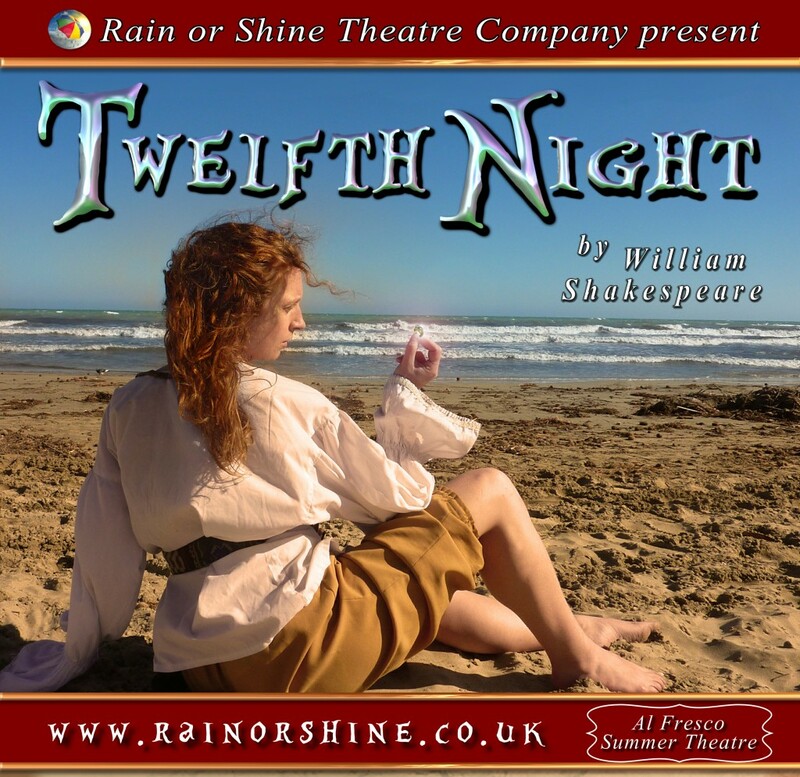 As part of their national tour for summer 2016, Rain or Shine Theatre Company is performing a fantastical Shakespearean delight, A Midsummer Night’s Dream, at a local Shropshire beauty spot. 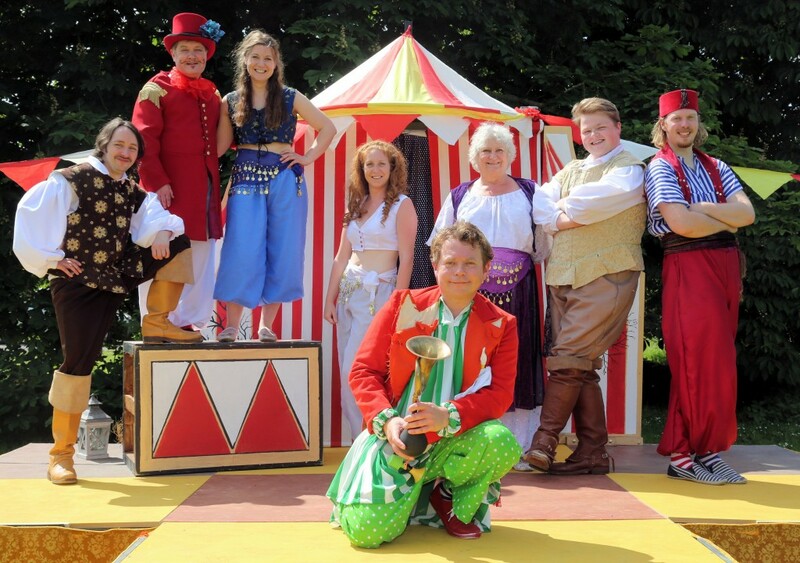 Shropshire Council rangers at Severn Valley Country Park are delighted to see the return of the company to the park on Friday 12th August for their outdoor performance of this magical and hilarious comedy. In the story the audience is asked to join the lovers, Hermia, Helena, Lysander and Demetrius this summer as Rain or Shine follow them into the intoxicating dream world of fairy queen and king, Titania and Oberon. With well-loved characters such as Bottom and Puck in tow, join us for a rip-roaring, fast-paced jaunt through Shakespeare’s best loved comedy this out-door season. Filled with magic and mischief, inspired by warm nights, young love and the Elizabethan Carnival, this is as show sure to delight. Rain or Shine is a Gloucester based professional theatre company which specialises in outdoor summer tours of classical theatre to castles, stately homes and gardens throughout the U.K. They have performed classic comedy productions of works by Shakespeare, Sheridan, Goldsmith, Wilde and Vanbrugh to tens of thousands of happy theatregoers since they were formed in 1998. Tickets are £13 Adult, £11 Concession, £6 Child (suitable for age 6 upwards). Tickets are available by calling 01746781192 and will be available to purchase on the door on the night. Gates open at 6.30pm with the performance starting at 7.30pm. Visitors are invited to bring a picnic and low backed seating to add to their enjoyment of the performance. 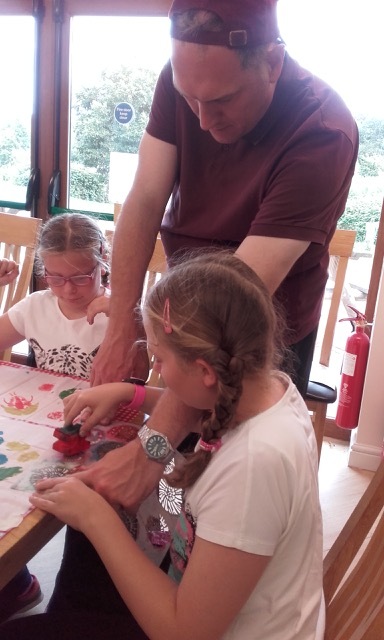 We had great fun on Wednesday with our Nature’s Art Attack session. During the sessions the children collected lots of leaves, grass twigs and other natural items from around the park. We had a great time mashing, squashing and bashing everything we found to make some paint to colouring a lovely landscape. A big thank you to Georgia Jacobs joined us to help the children make cards using cut out leaves, ink stamps and more. The children had a great time! We have events every Wednesday and Friday of the school holidays. 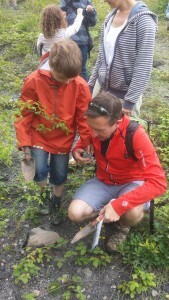 Geologists in the Geopark will be with us on Mon 8th August & Thurs 25th August for a Rock and Fossil Hunt. It’s going to be a fun summer! 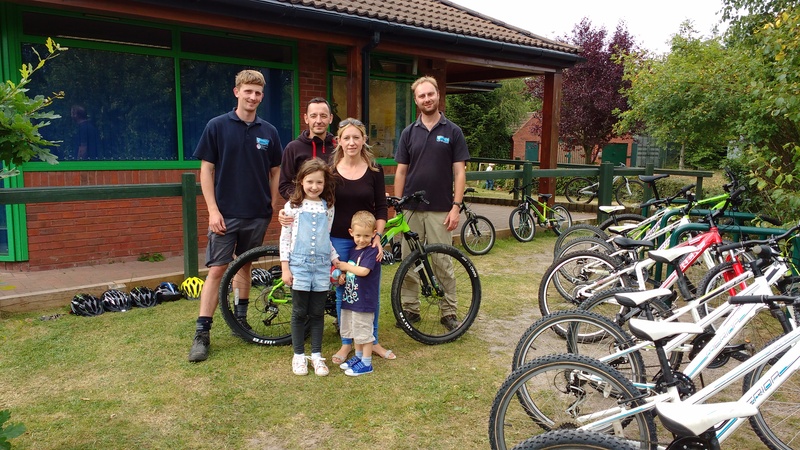 Rangers at Severn Valley Country Park are asking visitors to ‘Get on yer bike!’ Shropshire Council is working with the team at Wolverley Bike Hire to enable visitors to explore the park on 2 wheels. 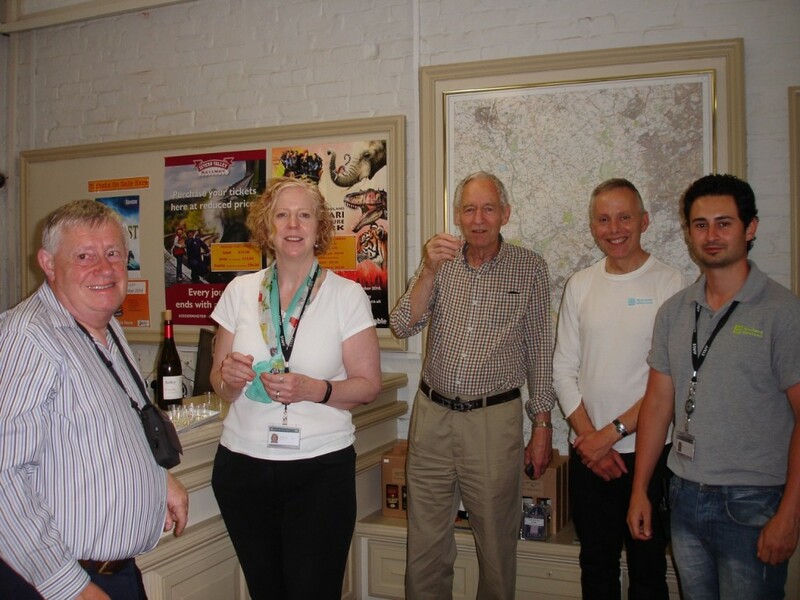 L-R Eddie Pugh (SVCP Ranger), Andrew Hackett (Wolverley Bike Hire), Anna Hackett (Wolverley Bike Hire), James Brookes (SVCP Ranger). Also pictured Mr & Mrs Hackett’s children. The country park is an ideal place for cycling as it is situated at the mid-way point between Bridgnorth and Bewdley on the Mercian Way. The Mercian Way, part of the national cycle network runs through the park and beyond, allowing riders to enjoy miles of off-road tracks along the river Severn and through woods and meadows. It is a great way to see the spectacular Shropshire scenery away from the frenetic pace of everyday life. Wolverley Bike Hire is a family run business which has a fleet of quality British designed hire bikes. The bikes are regularly safety checked and cleaned after every rental and included with each rental is a helmet, puncture repair kit, tyre levers and a pump. Bikes are available to be hired by prior arrangement by contacting www.wolverleybikehire.co.uk or 07891309783. The bikes will be delivered directly to the park and can be hired for a full day or half a day. The prices are: Adult bike £25.00 per day / £15.00 half day; children’s bike £18.00 per day / £10.00 half day. Rental period is from 9.00am until 5.00pm. 15% of each rental goes directly to help support the running of the country park. The President of the Geopark Chris Darmon made a visit to GeoFest on 22nd, 23rd and 24th July. 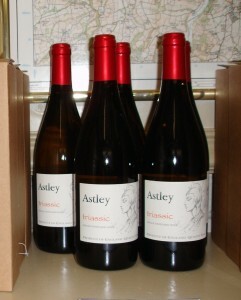 During his time with us he launched the revamped GVIP (Geopark Visitor Information Point) at Bewdley Museum, he promoted Triassic wine from Astley Vineyard which is for sale in Bewdley Tourist Information Centre and he opened the geology inspired textile demonstration and visited the ‘One Grain’ exhibition, both at the Museum. Ross Iannoccaro explains the additions to the Geopark Information Point. There is so much going on in GeoFest with plenty more to come in August. Details are in the calendar on the website. 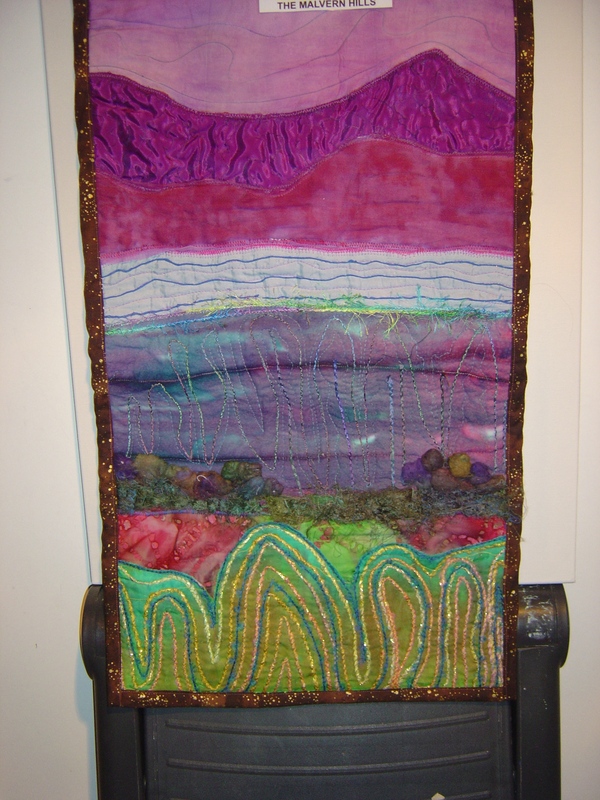 The textiles exhibition ‘Geology at Different Scales’ continues at Bewdley Museum until 11th September. 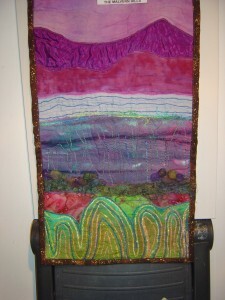 Georgia Jacobs with her geology inspired textile demonstration. 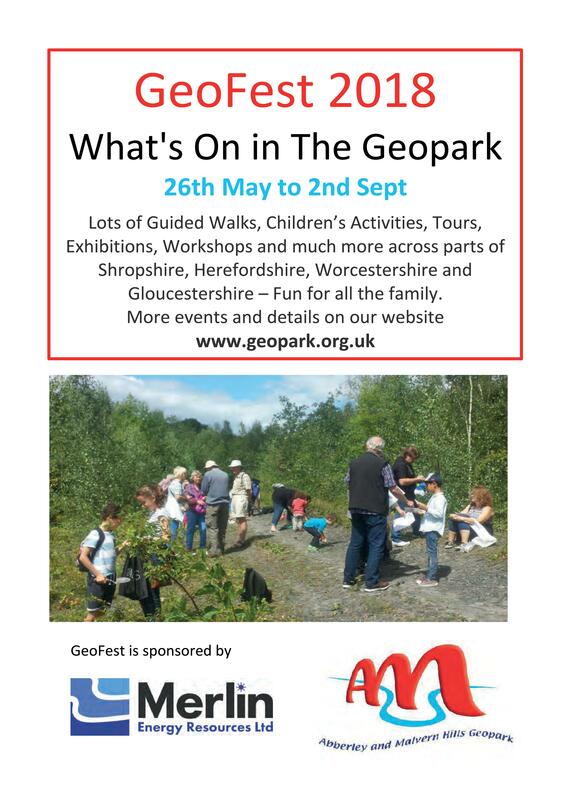 GeoFest is the Abberley and Malvern Hills Geoparks annual celebration of events. The members of the Geopark Forum host events throughout June, July and August that highlight and promote the geology, landscape and associated heritage of the Geopark. 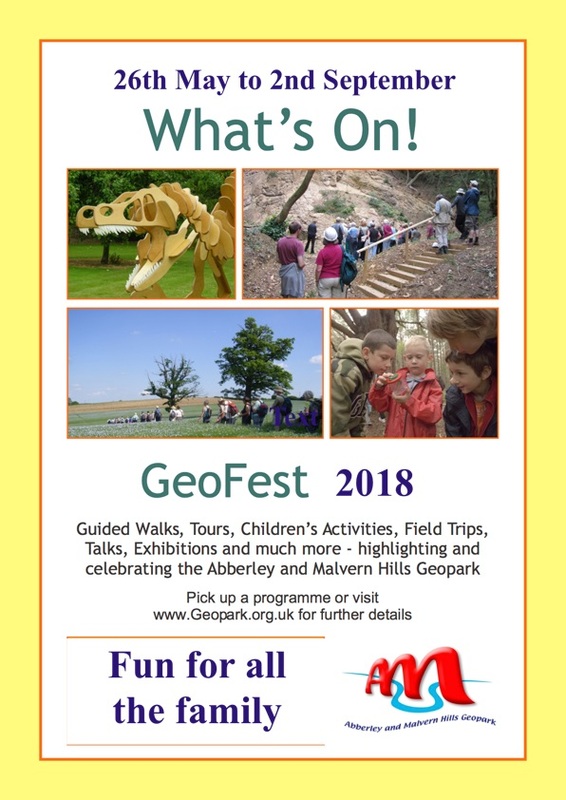 GeoFest events include walks, talks, exhibitions, demonstrations and children’s and family activities along with ‘Ask the Expert’ sessions and demonstrations which explore the geology, landscape, history and wildlife of the Geopark. GeoFest is launched by the Geopark president, Chris Darmon. Chris is well known to many for his passion for geotourism in the UK and overseas, his communication of geology to the general public and as Editor of Down to Earth magazine. 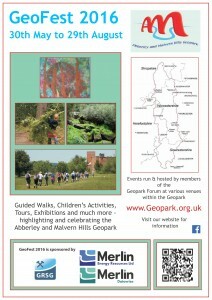 GeoFest is the Abberley and Malvern Hills Geopark’s annual three month long celebration of its geology, landscape and associated heritage. Events are hosted and run by the members of the Geopark Forum. a ‘Building Stones Roadshow’ at Worcestershire County Museum, Hartlebury Castle. Revel in rock and stone activities, enjoy making your own clay dinosaurs and snake mobiles, meet Vernon the life sized Velociraptor and follow the building stones trail with The Earth Heritage Trust. 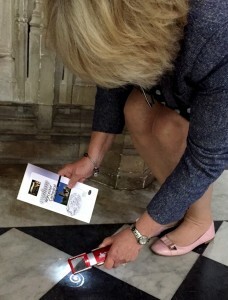 Click here to download a programme.